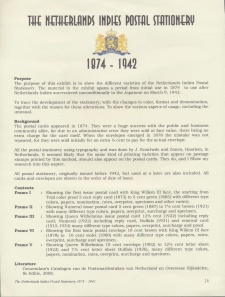 1874/1942. 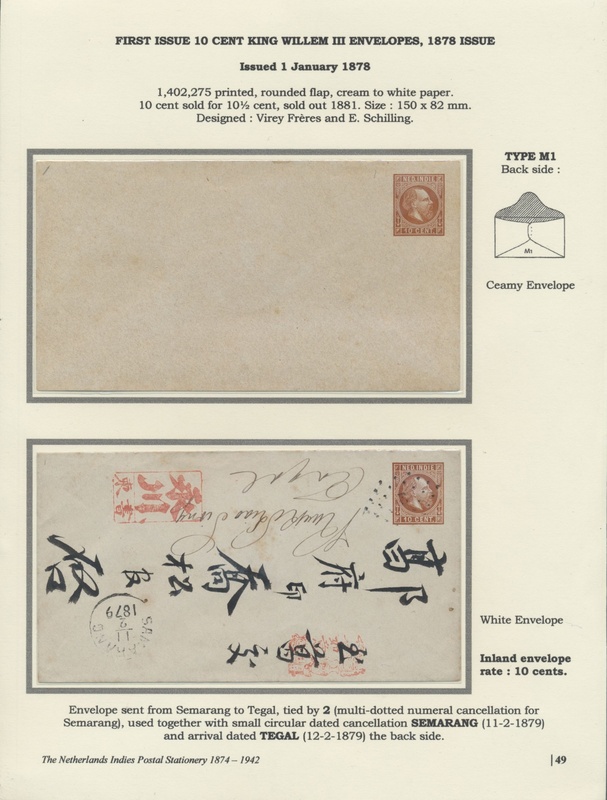 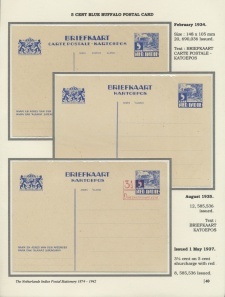 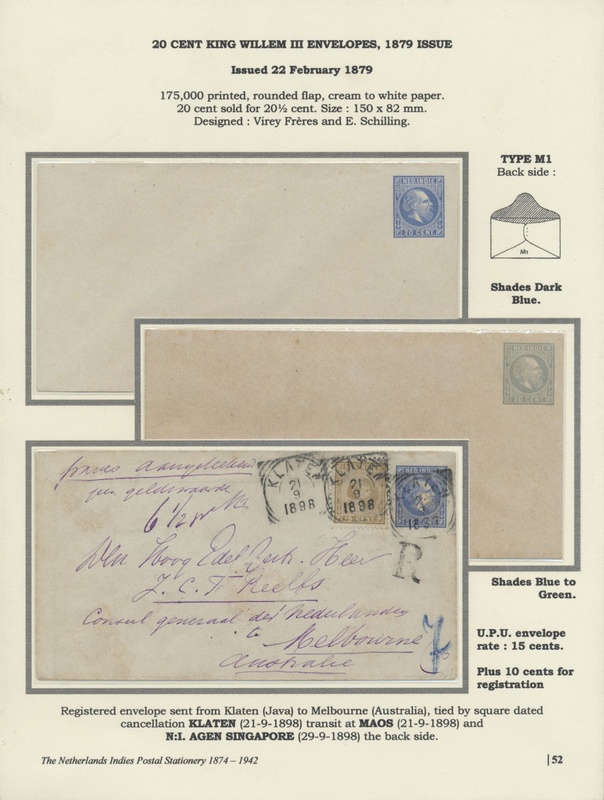 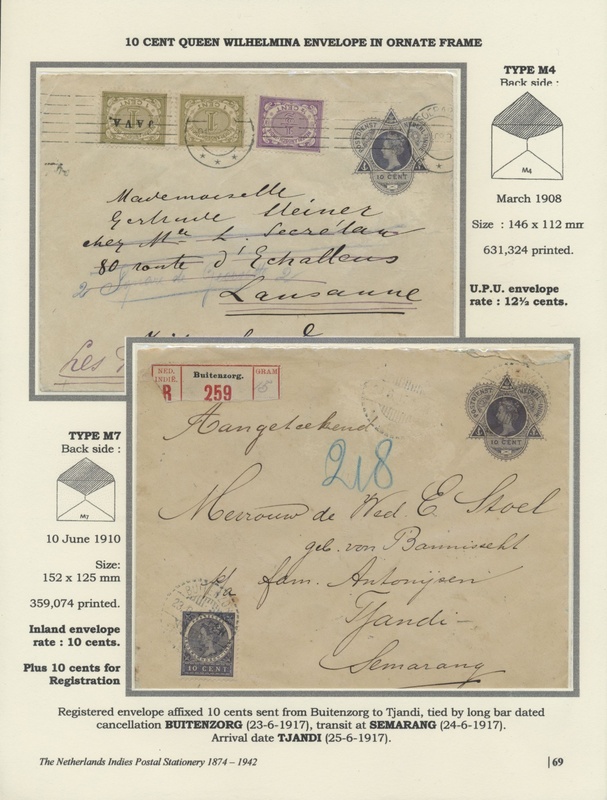 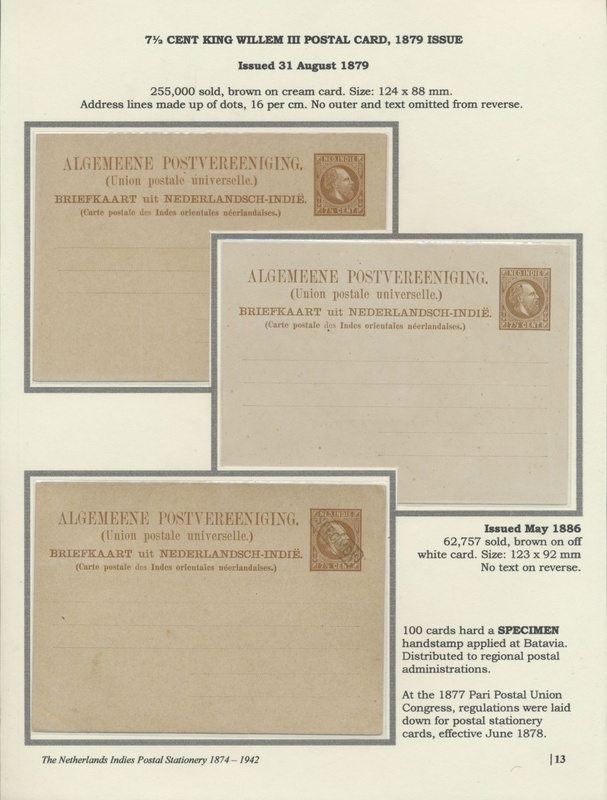 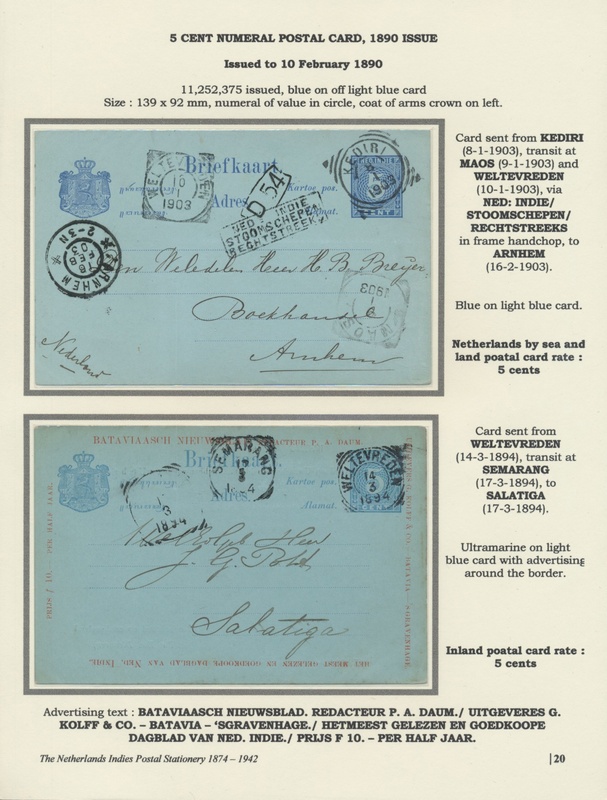 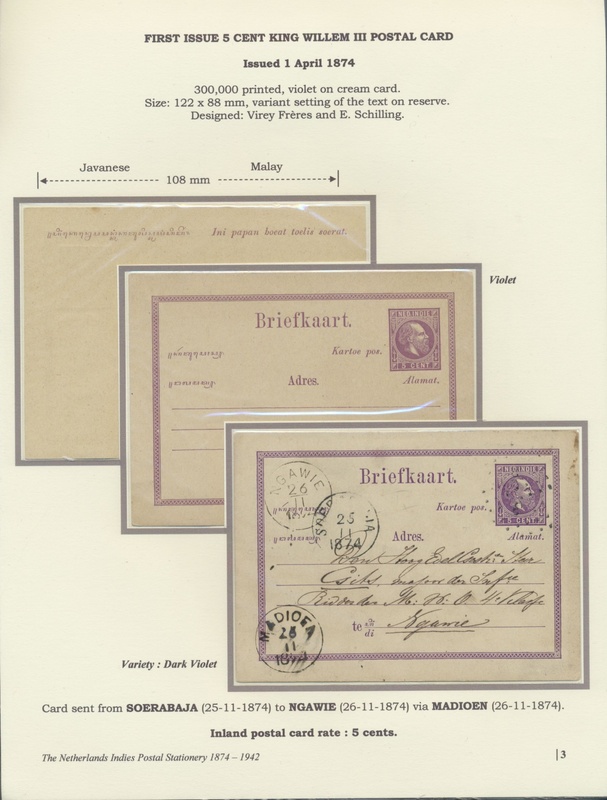 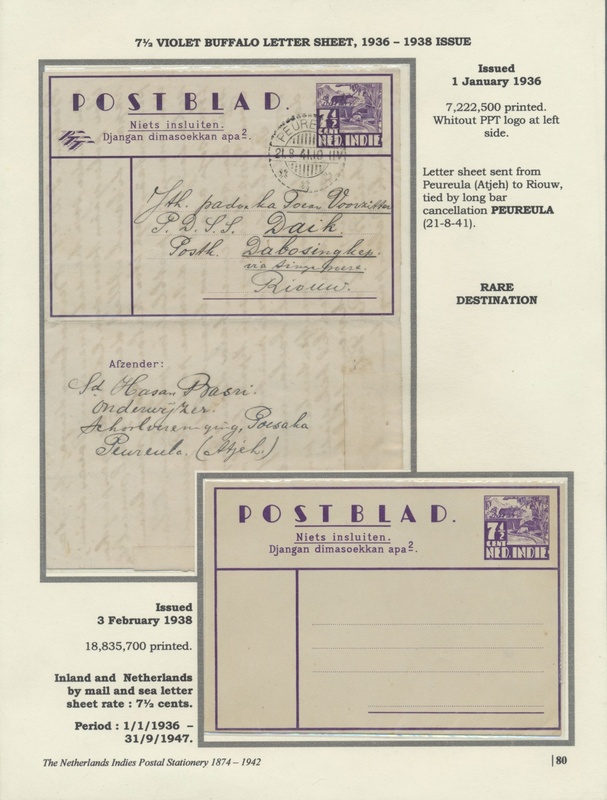 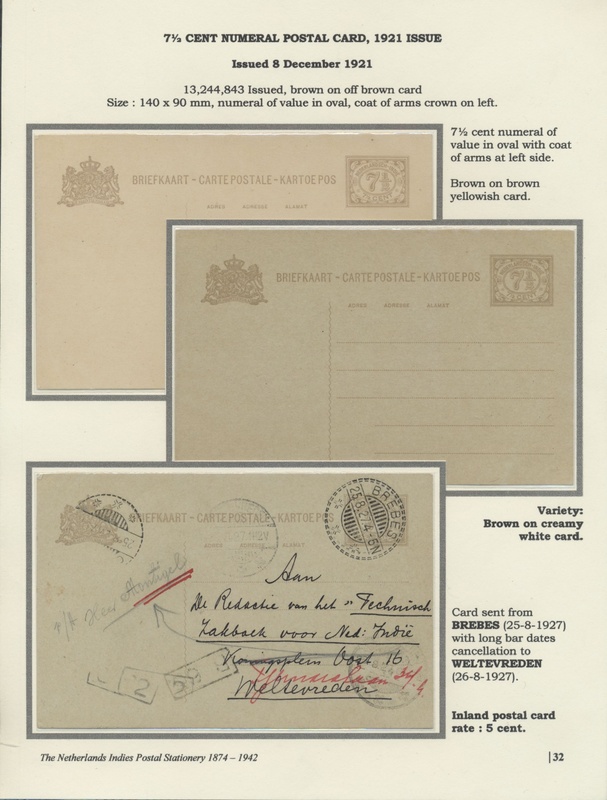 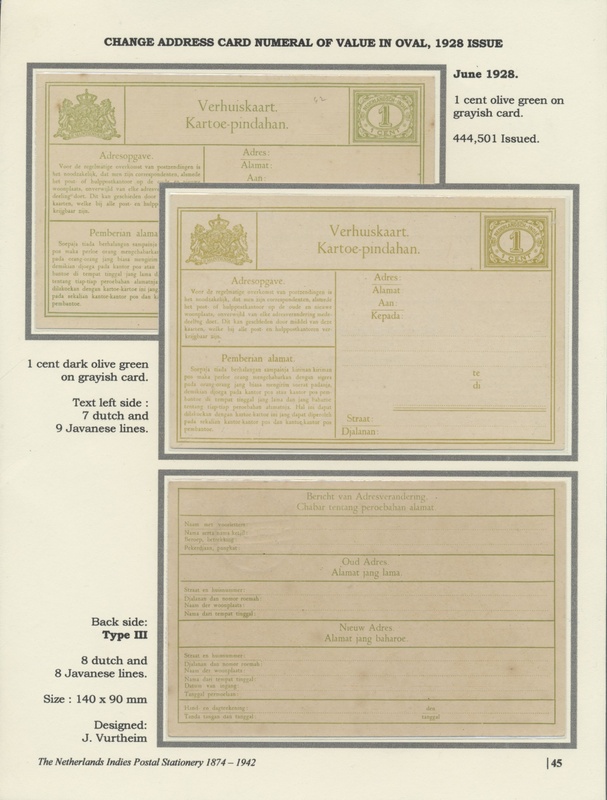 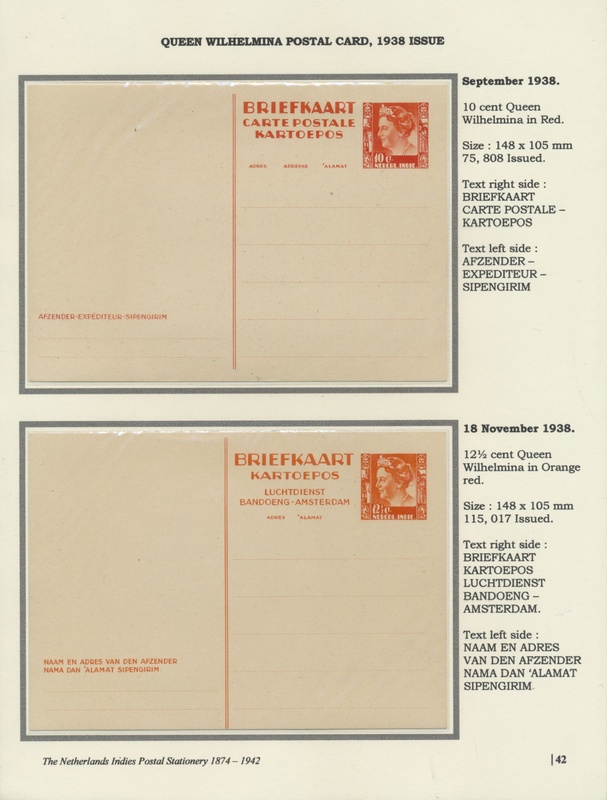 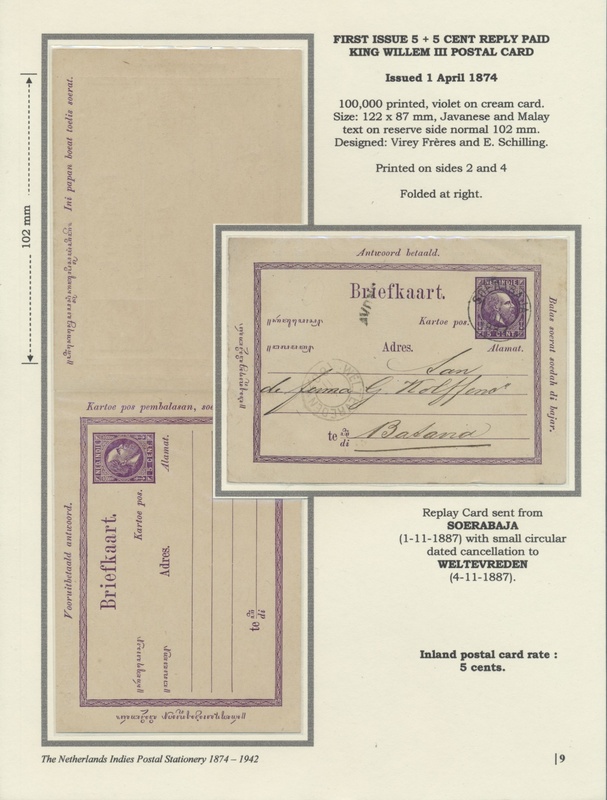 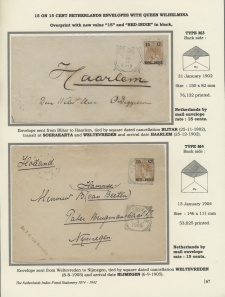 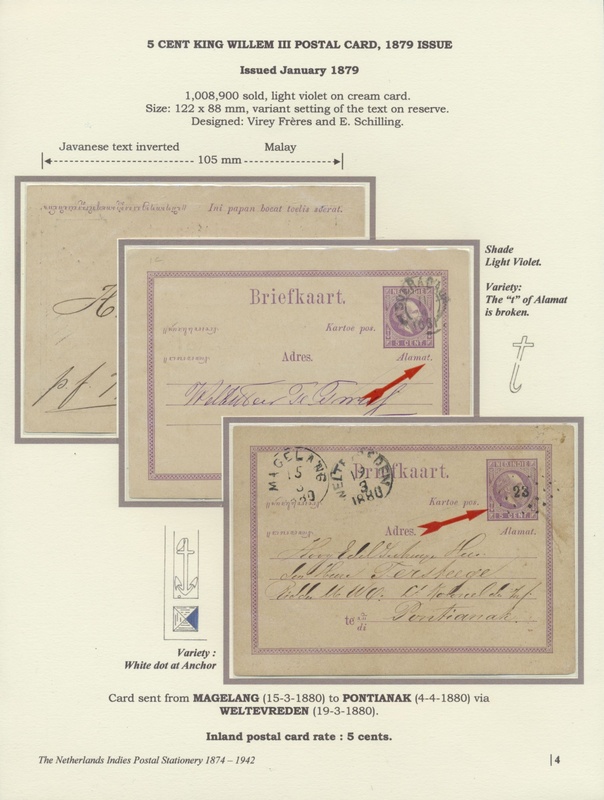 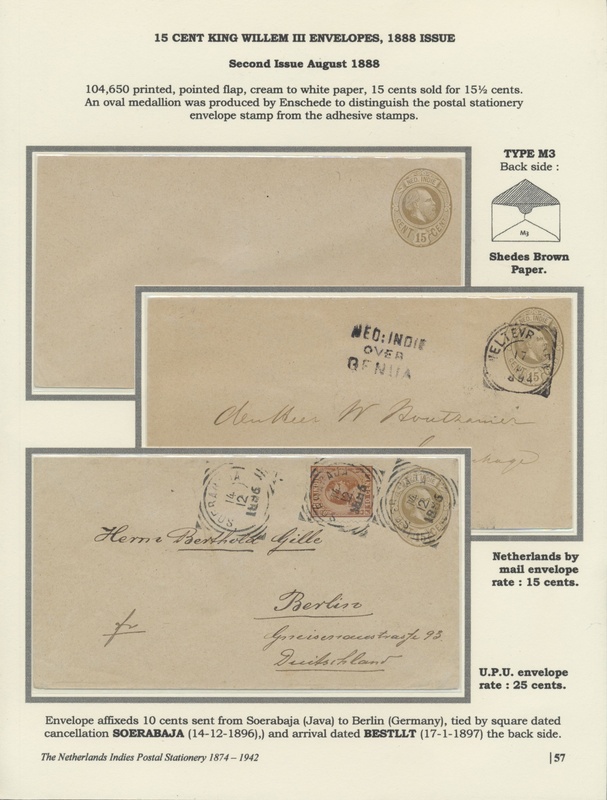 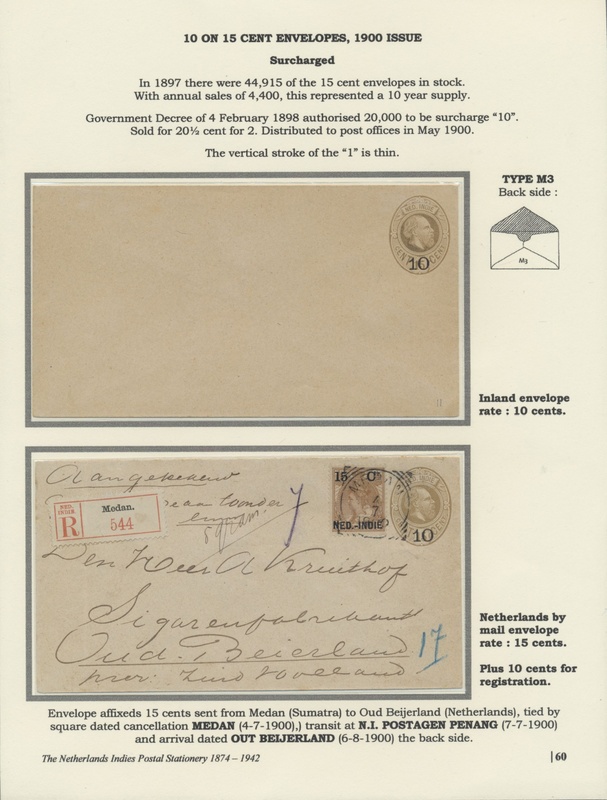 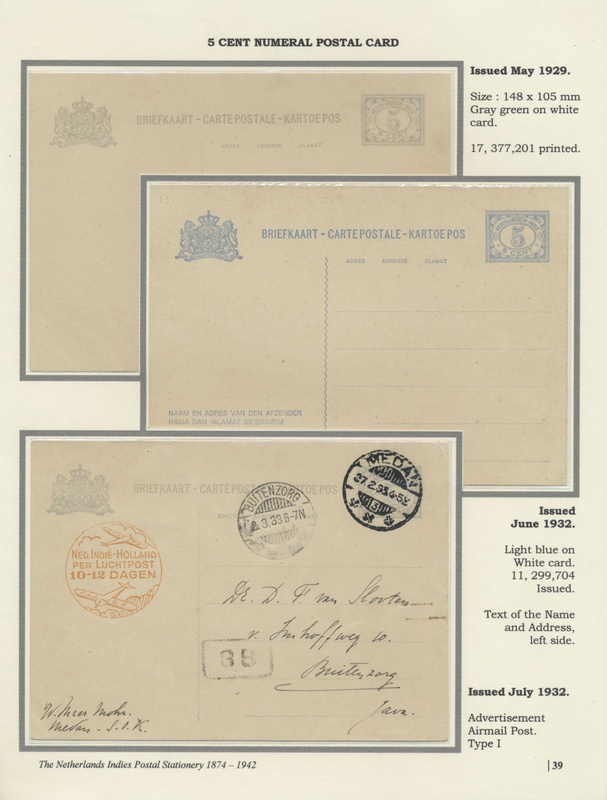 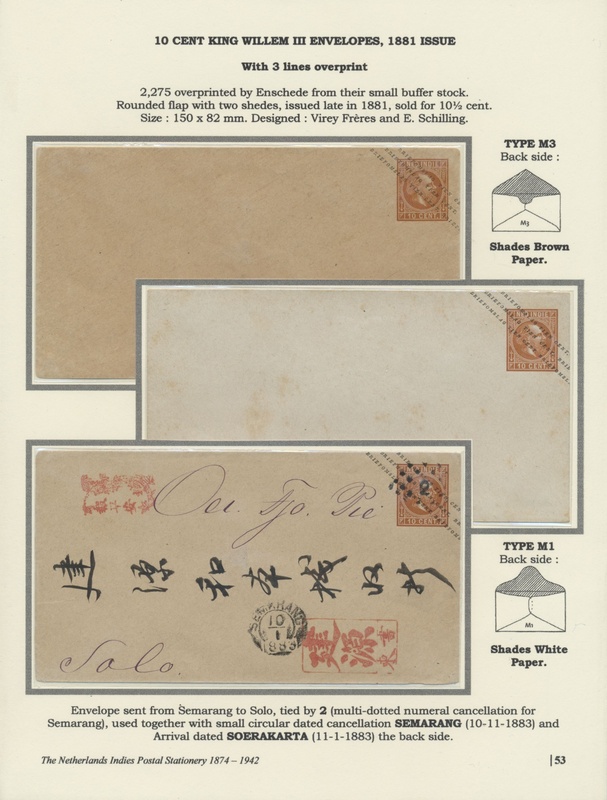 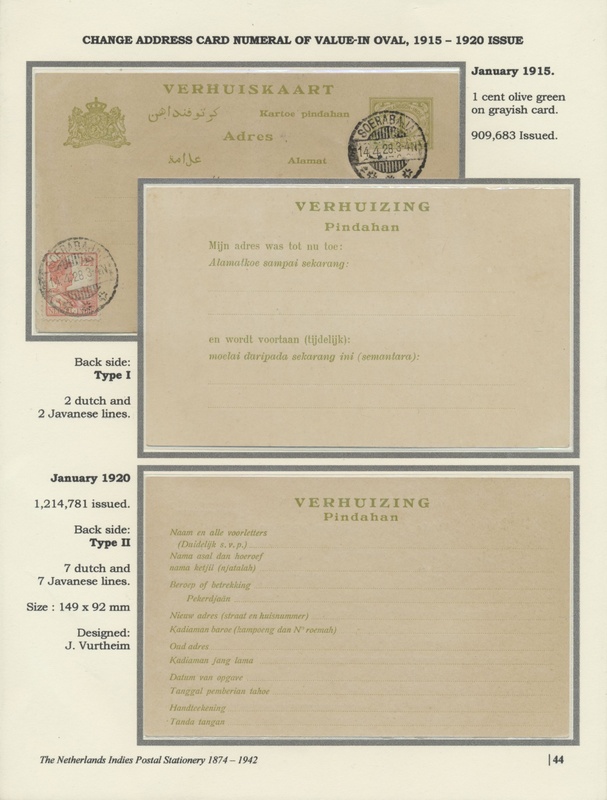 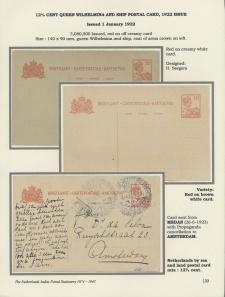 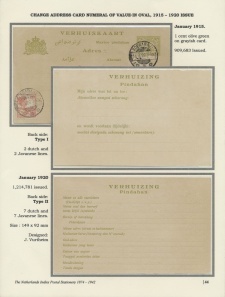 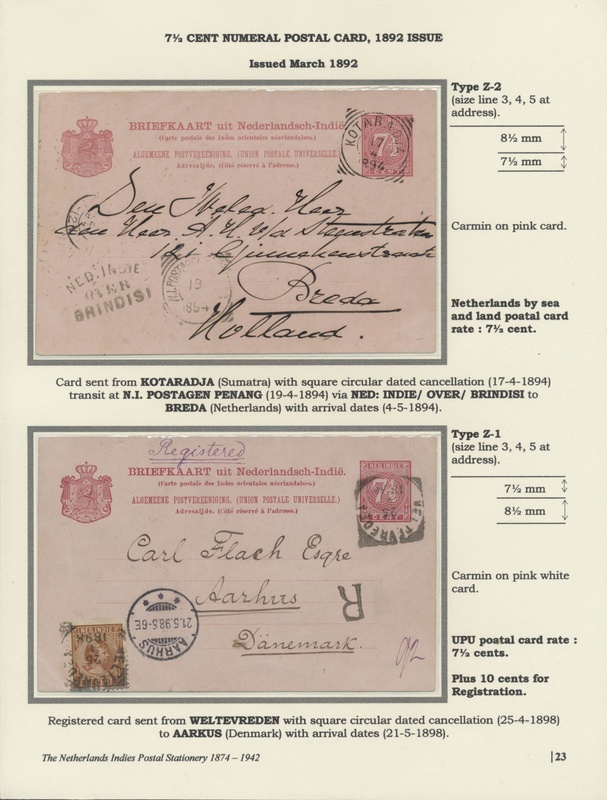 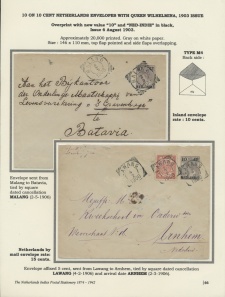 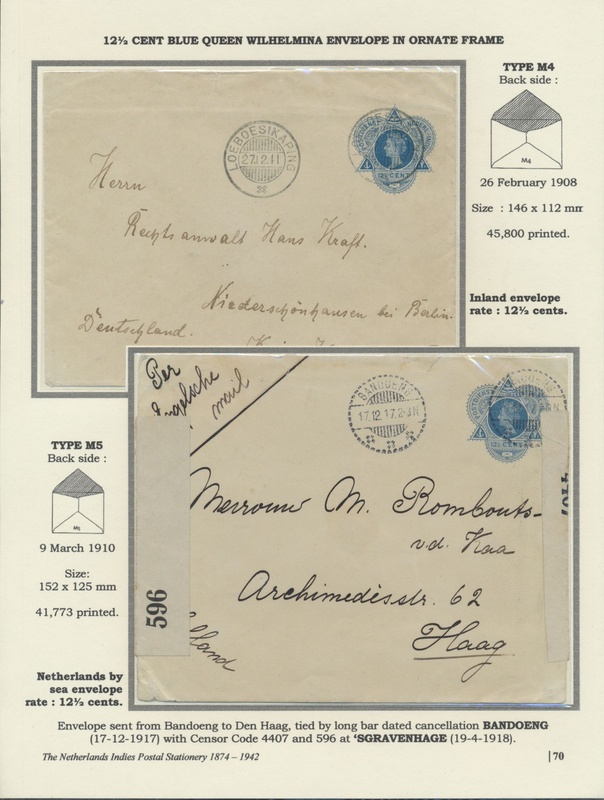 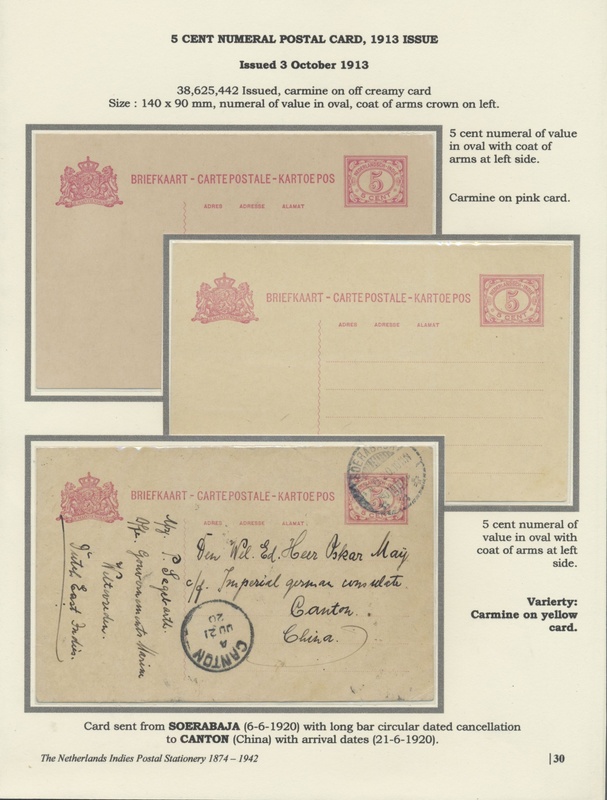 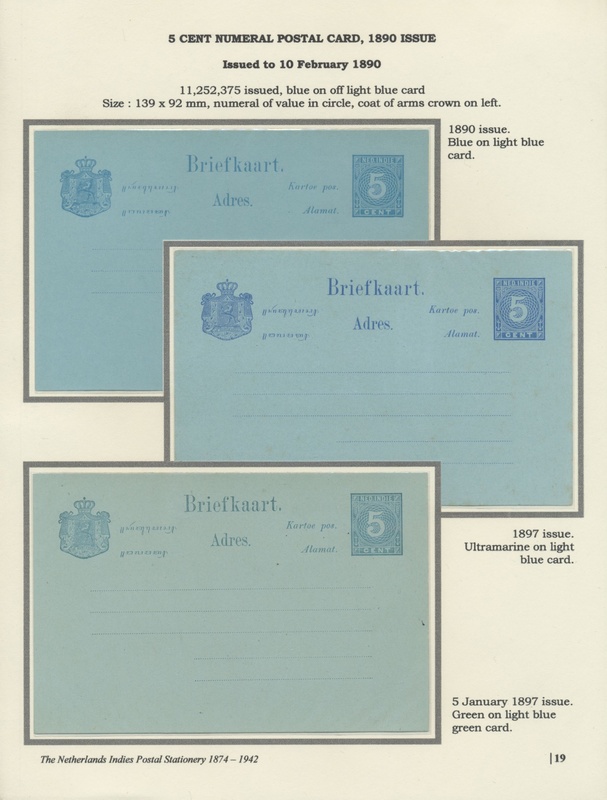 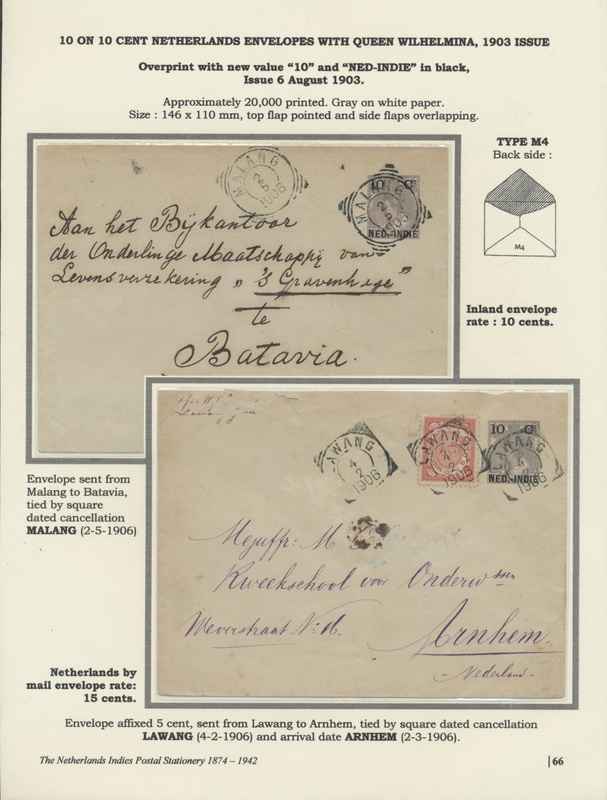 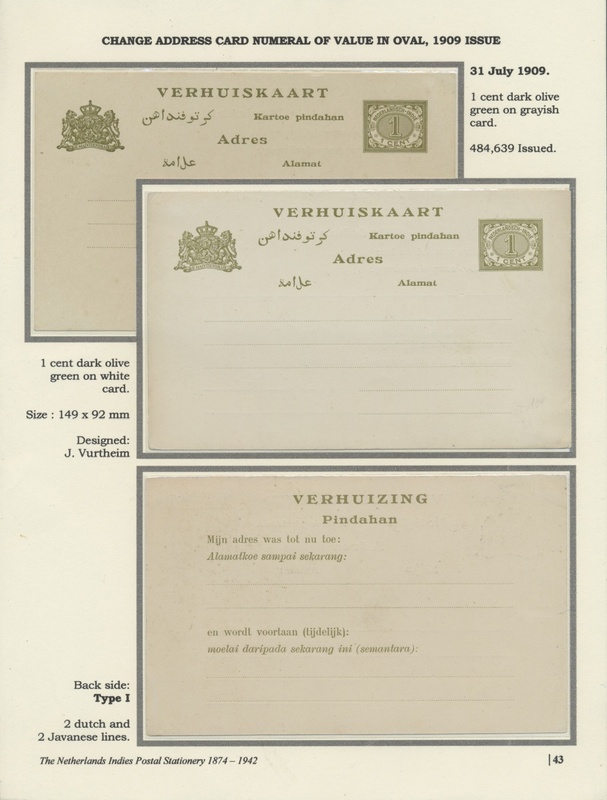 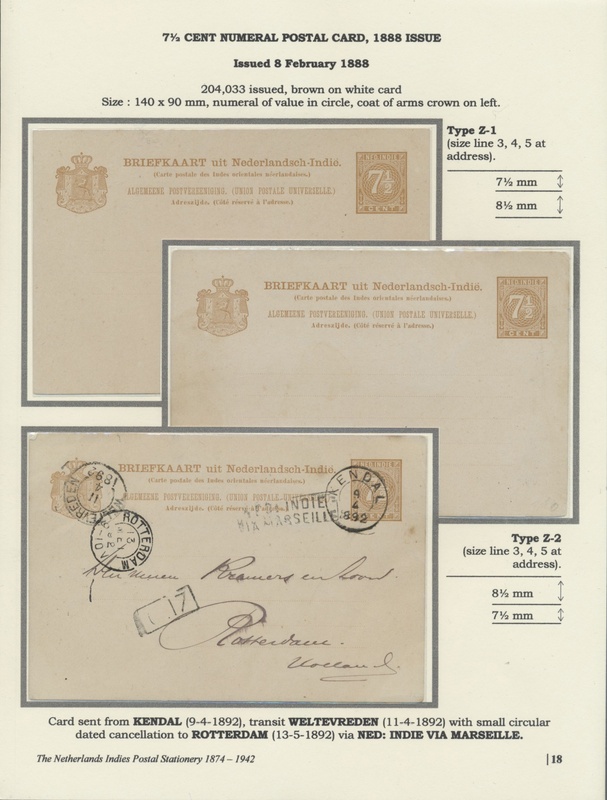 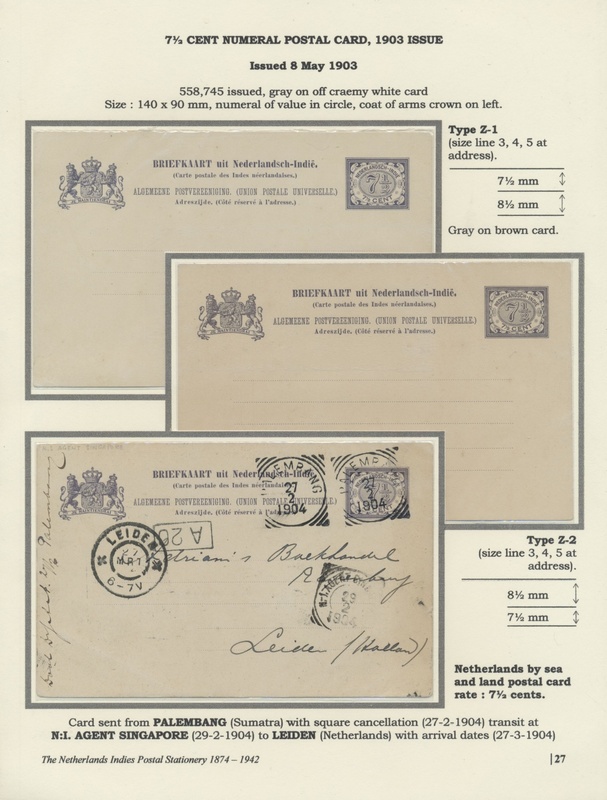 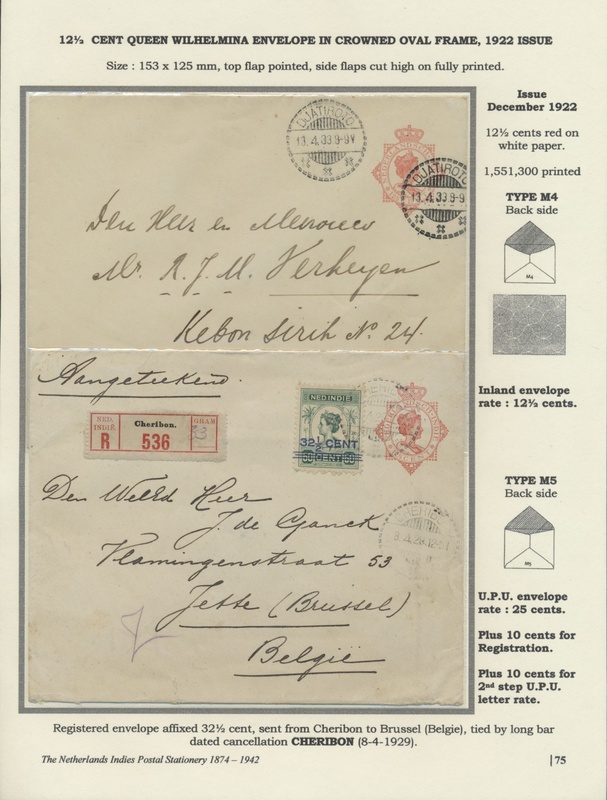 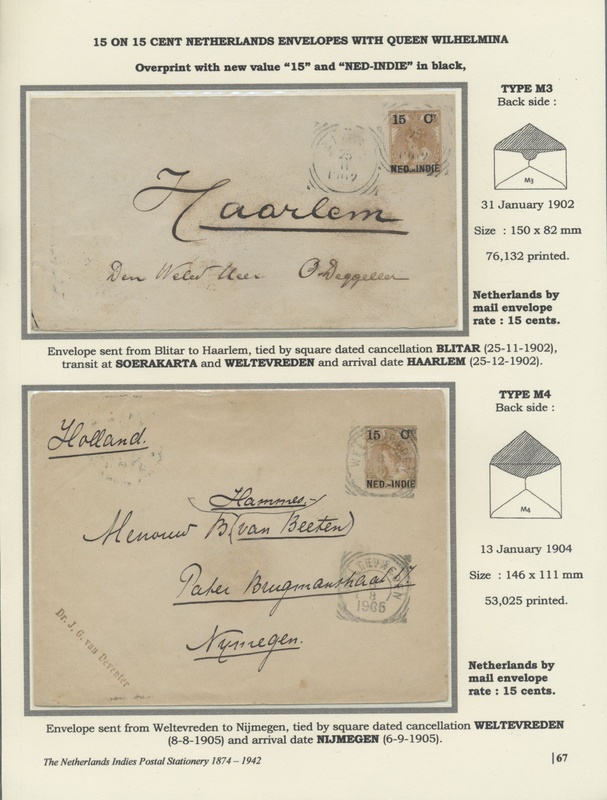 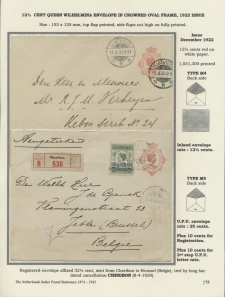 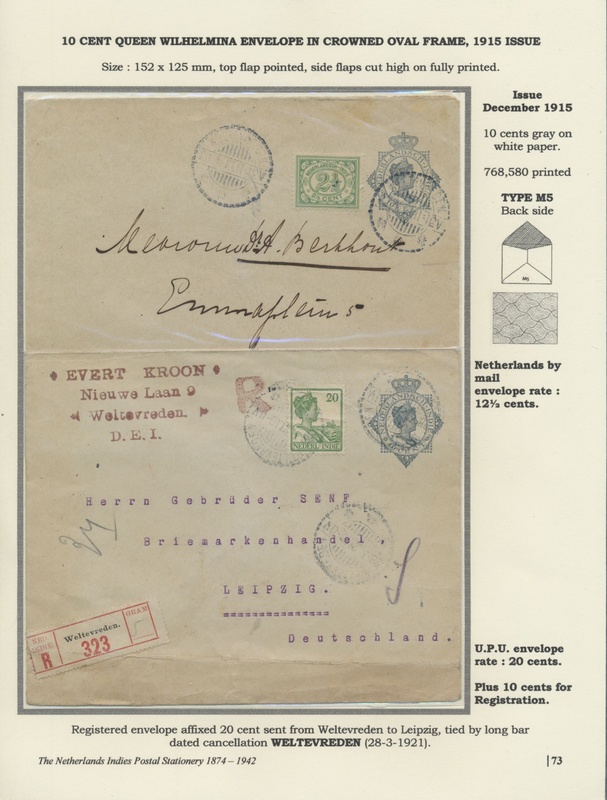 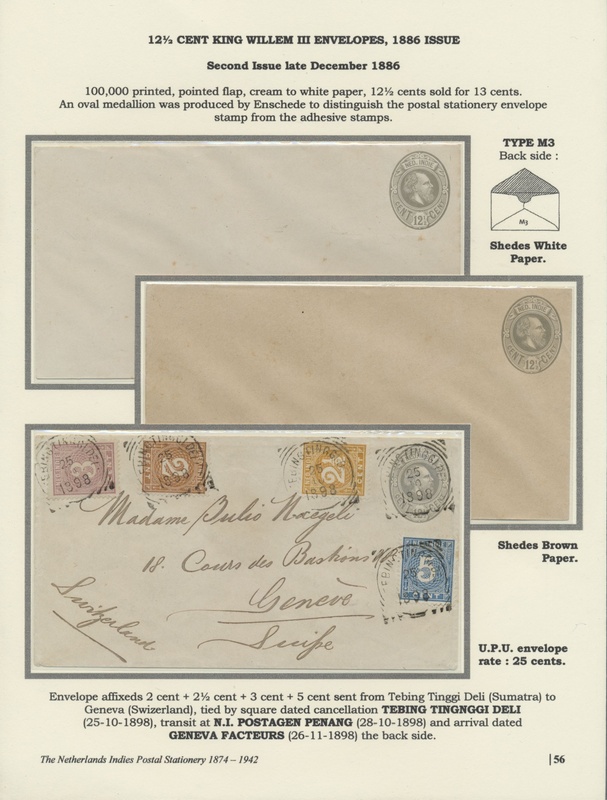 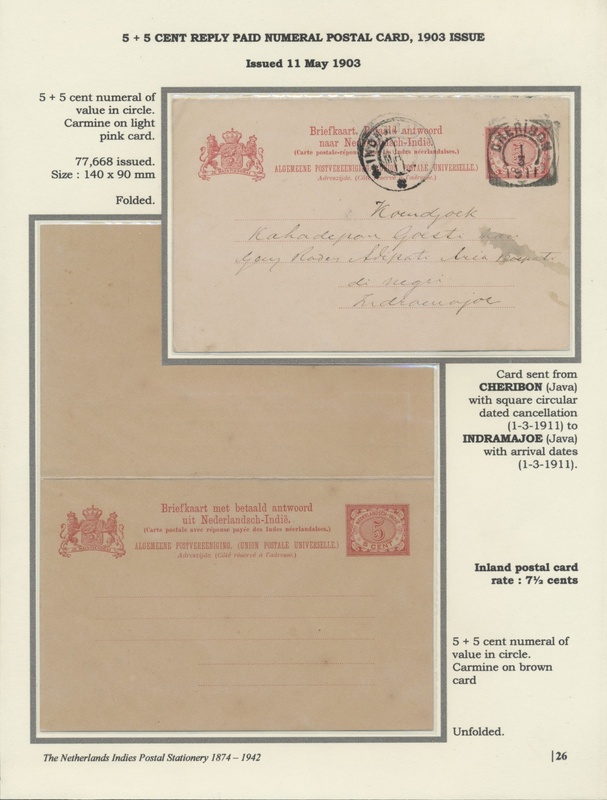 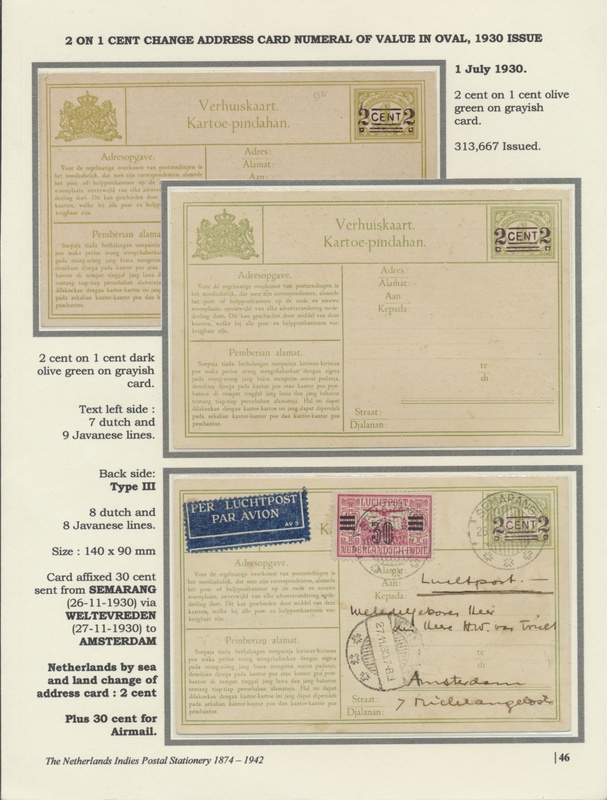 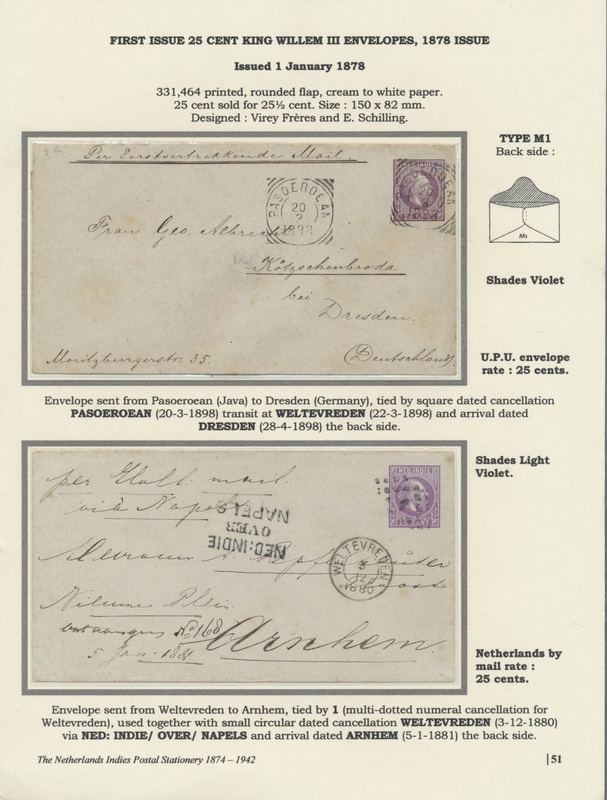 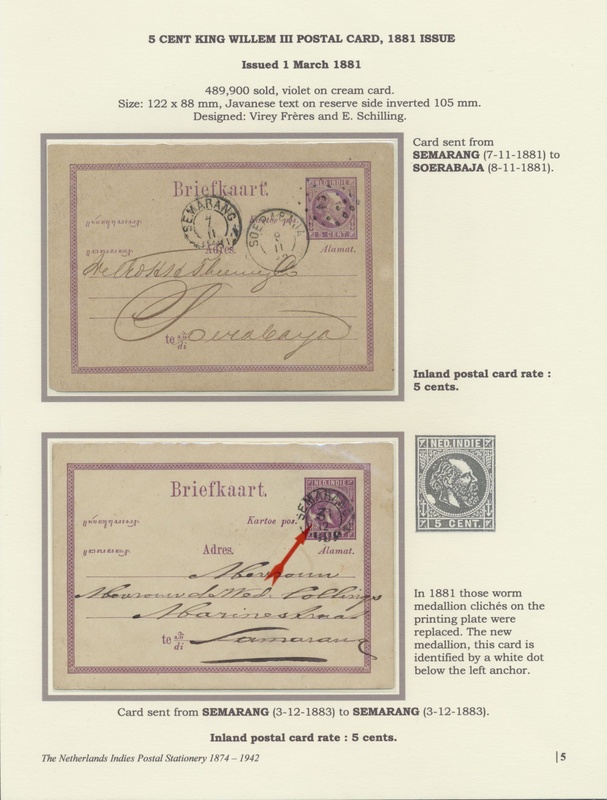 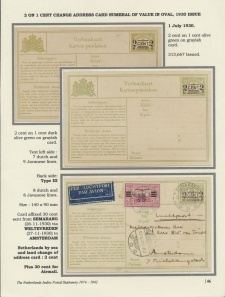 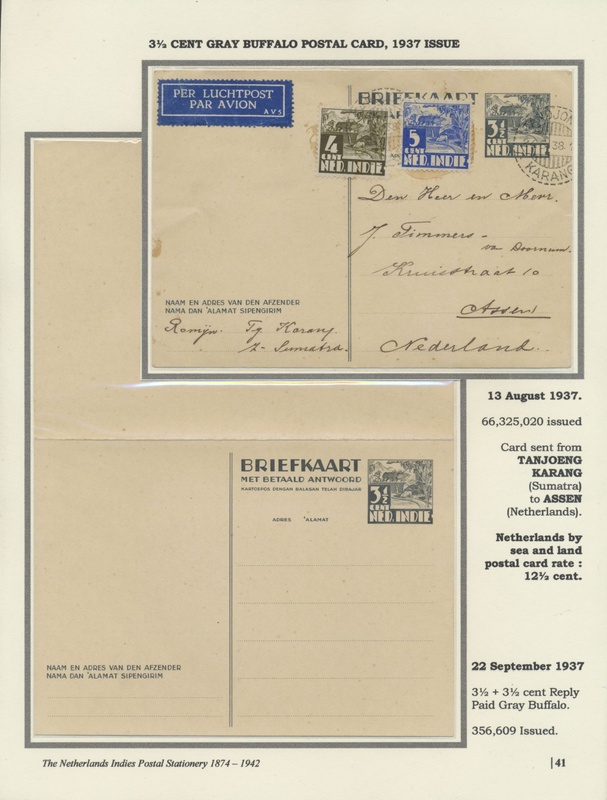 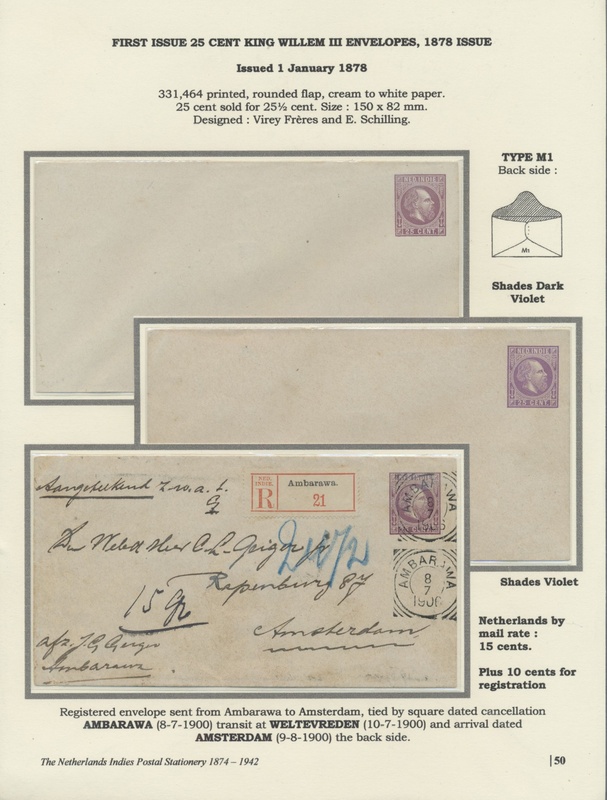 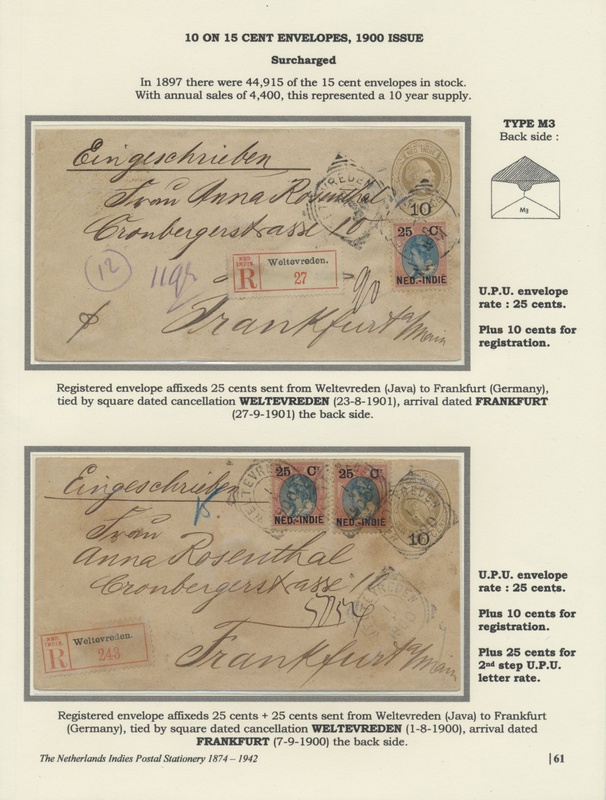 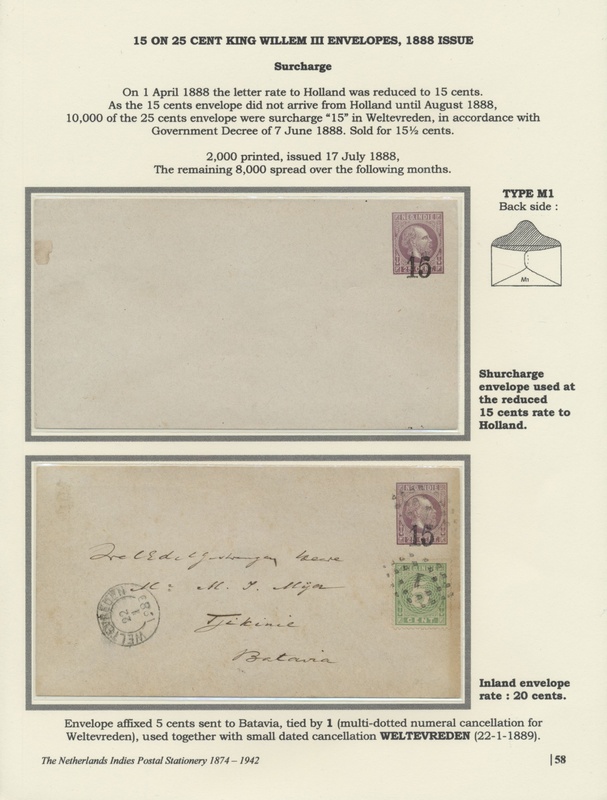 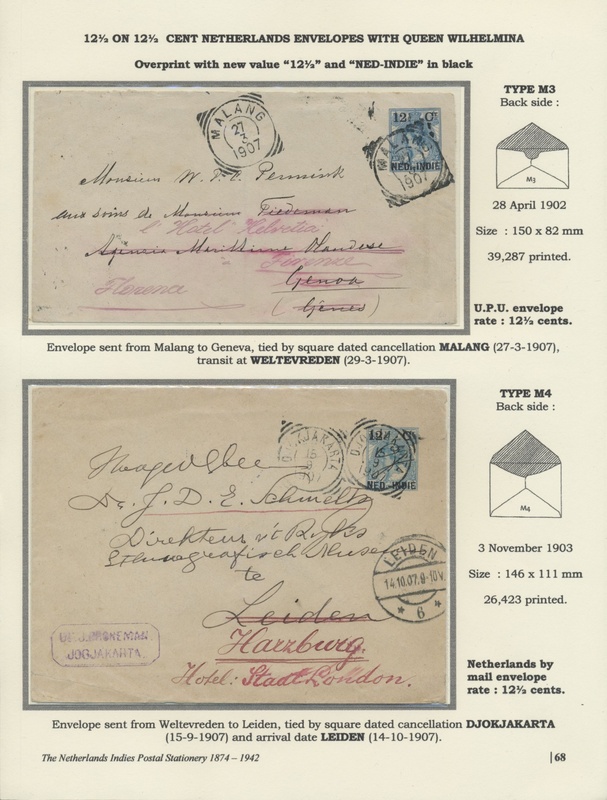 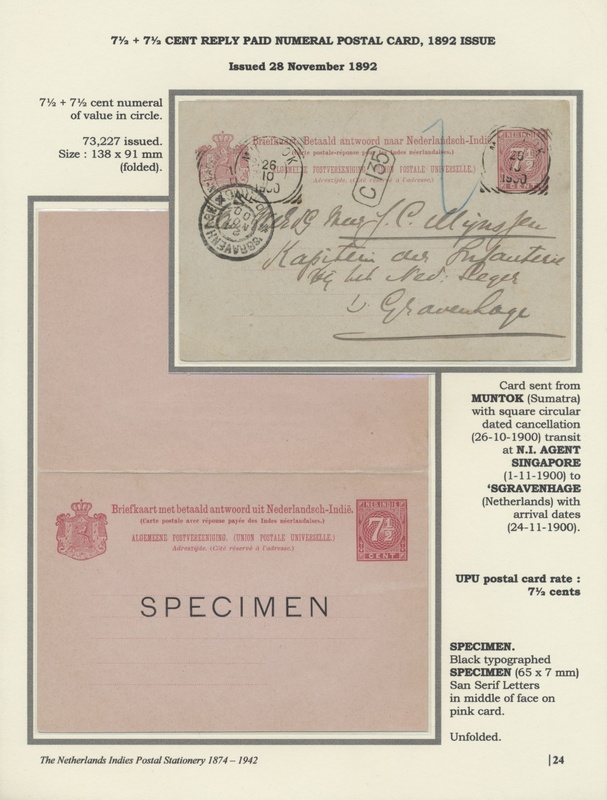 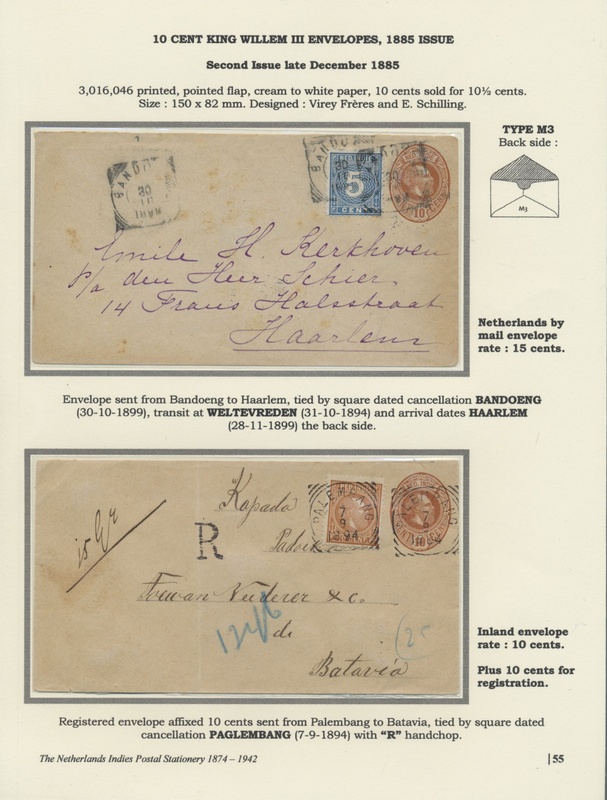 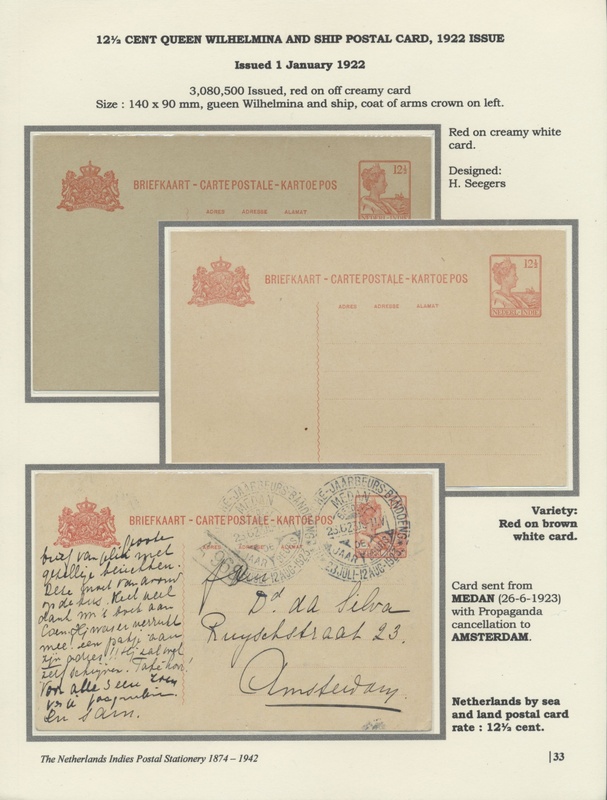 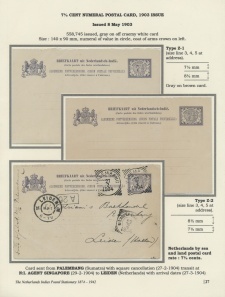 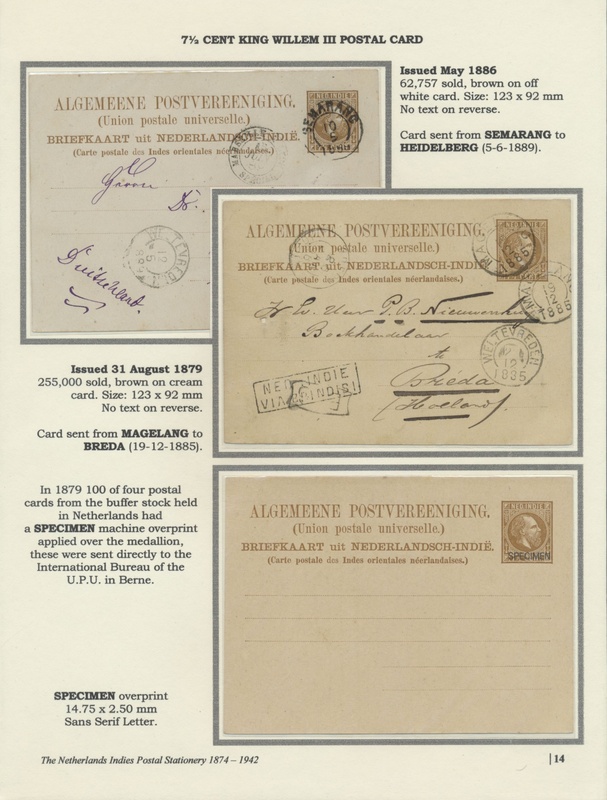 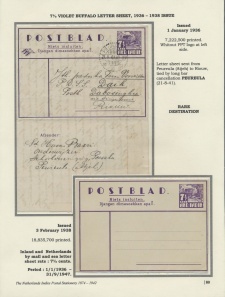 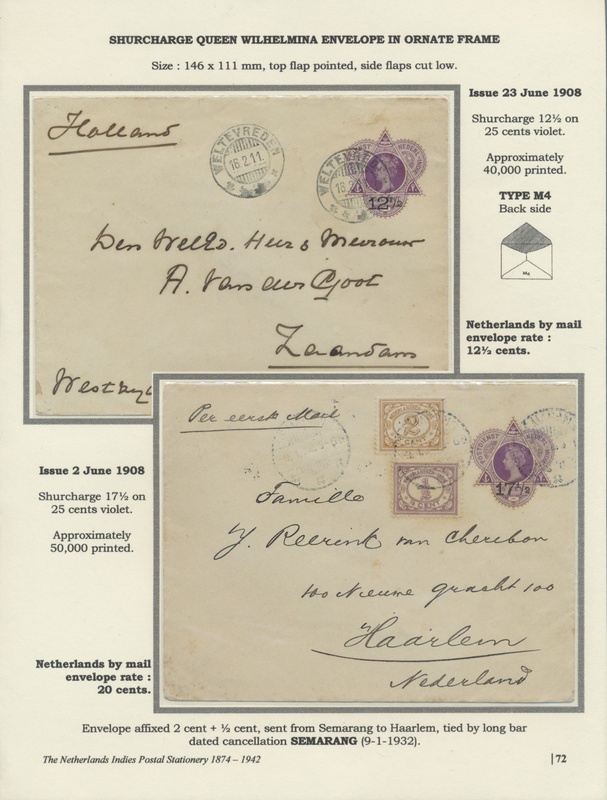 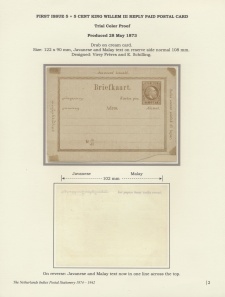 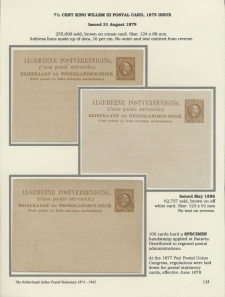 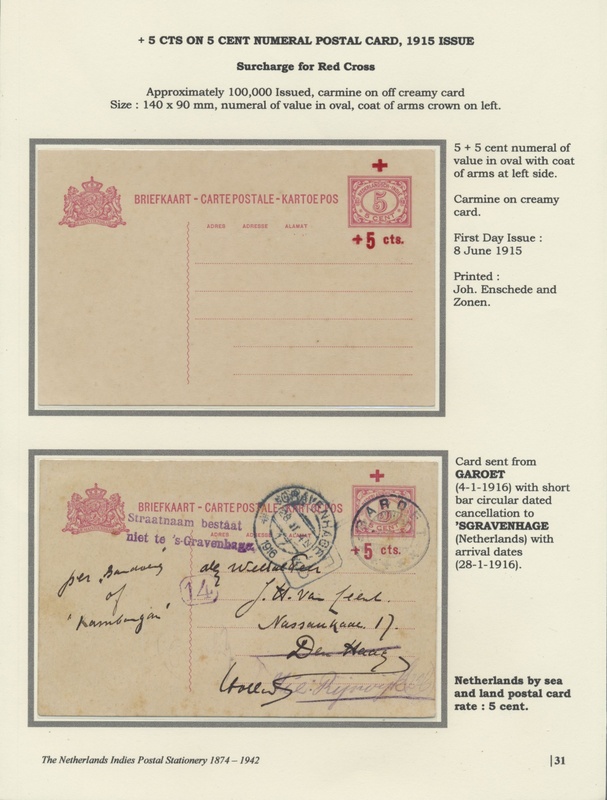 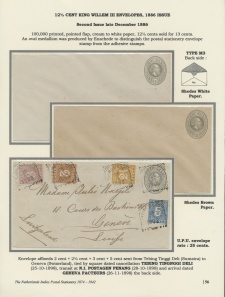 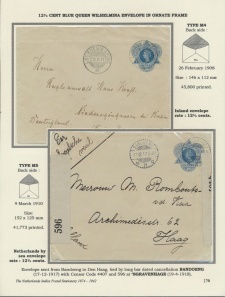 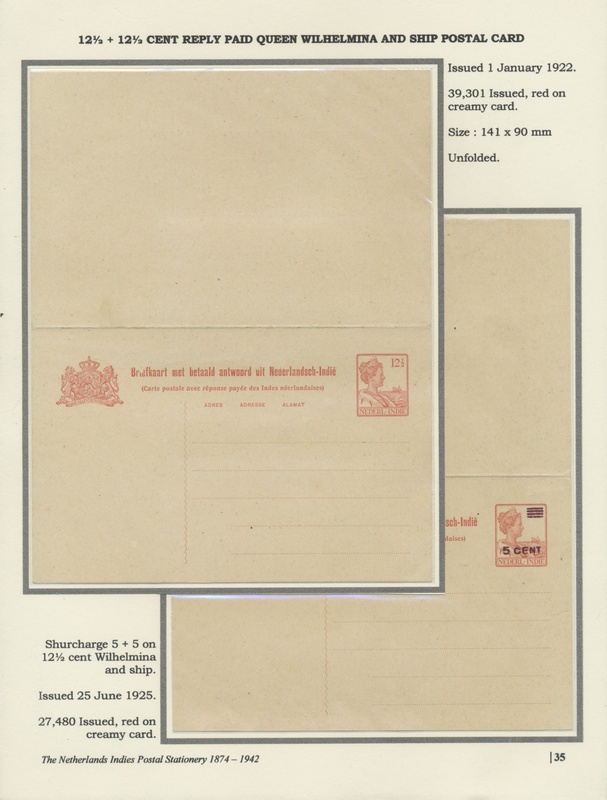 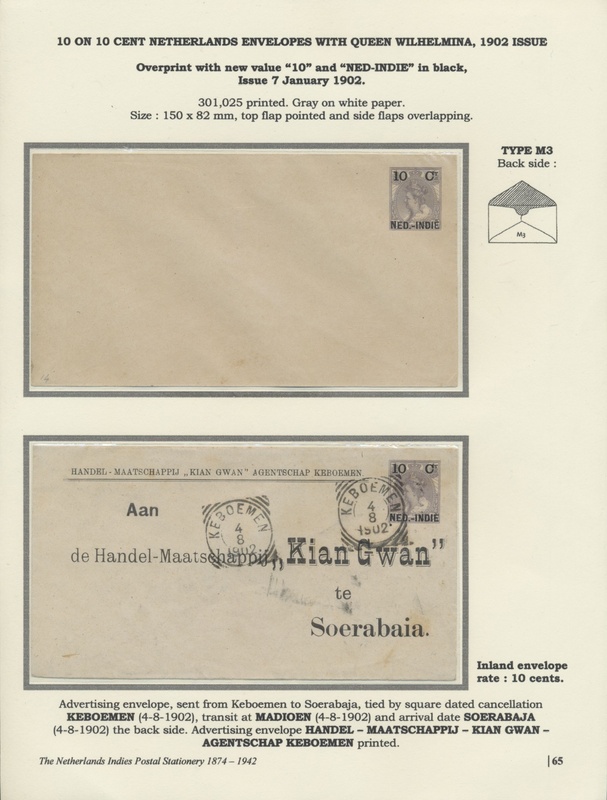 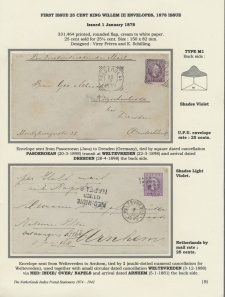 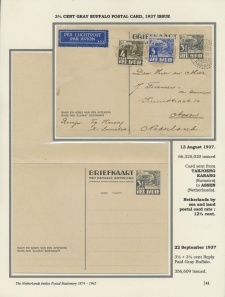 Charming exhibit THE NETHERLANDS INDIES POSTAL STATIONERY stored on 80 competent arranged sheets with descriptive annotations and explanations. 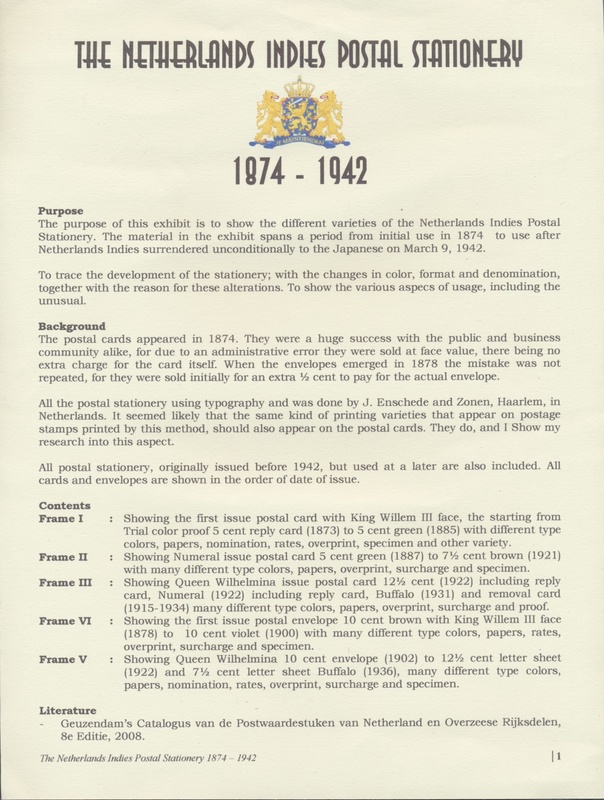 The purpose of this collection is to show the different varieties of this topic, to trace the development of the entires with the changes in color, format and face values, together with the reason for these alterations, and to show the various aspects of usage, including the unusual. 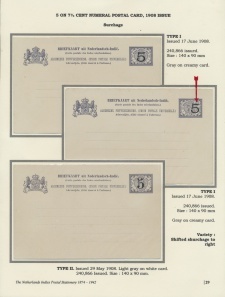 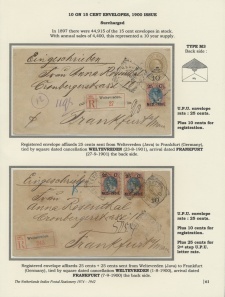 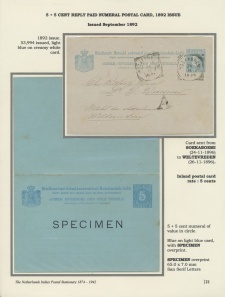 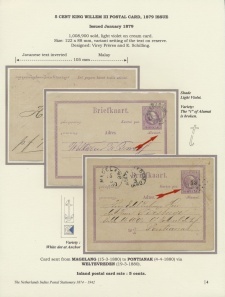 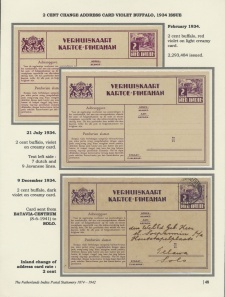 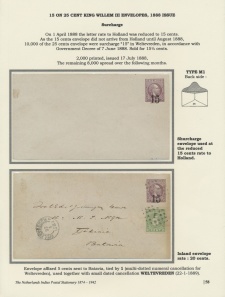 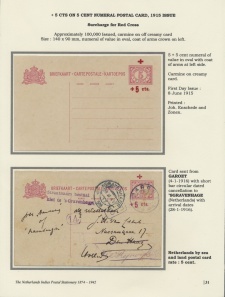 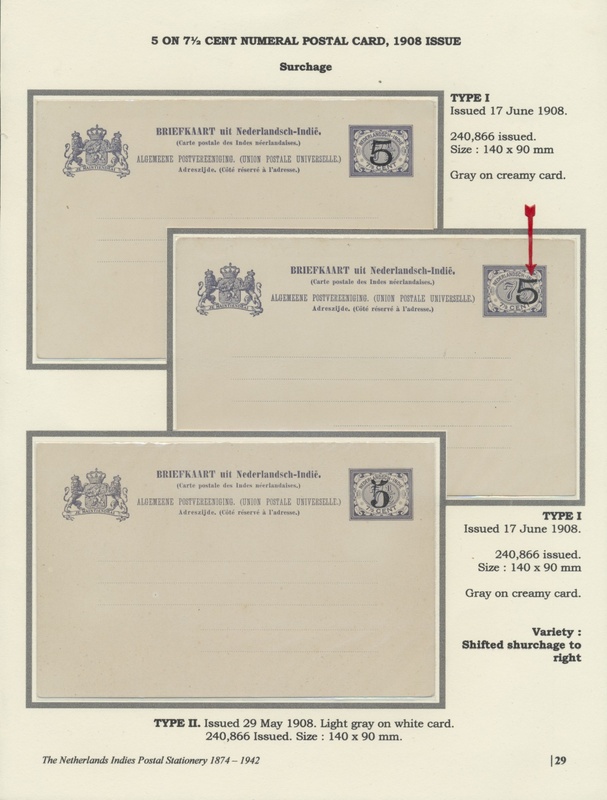 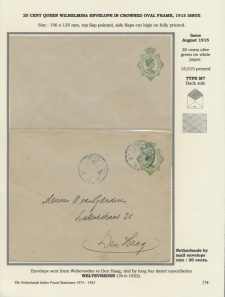 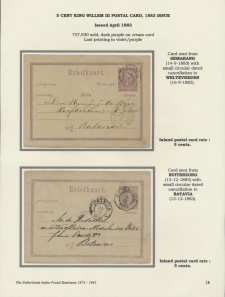 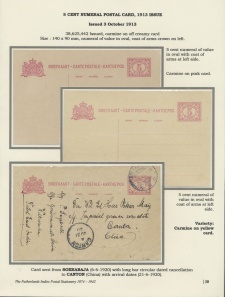 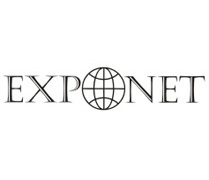 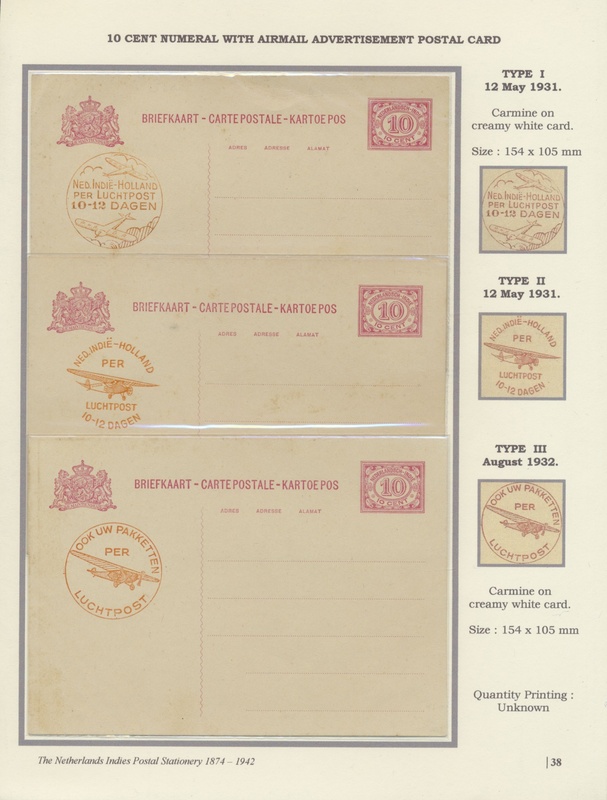 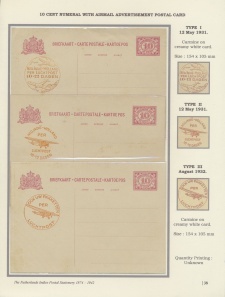 All cards and covers are shown in the order of date of issue. 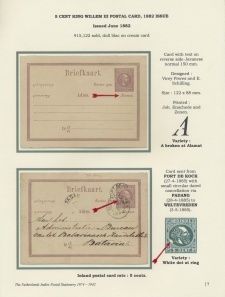 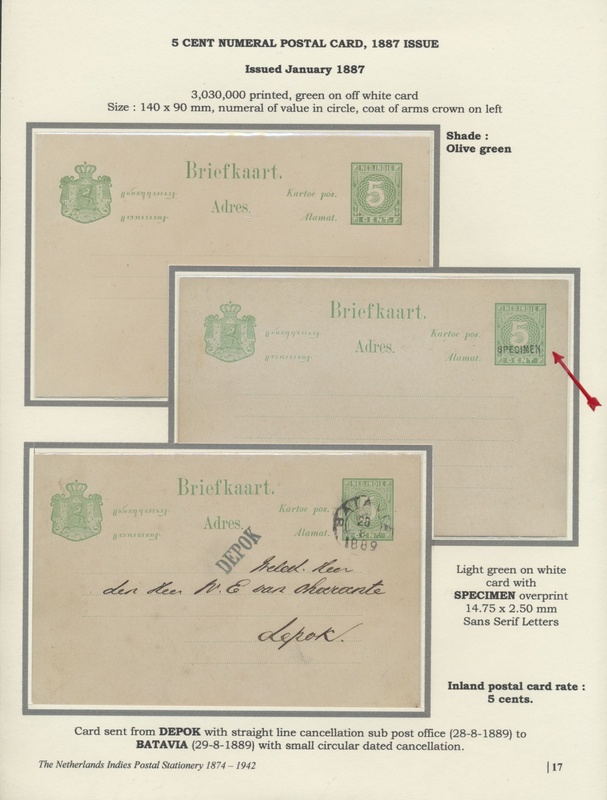 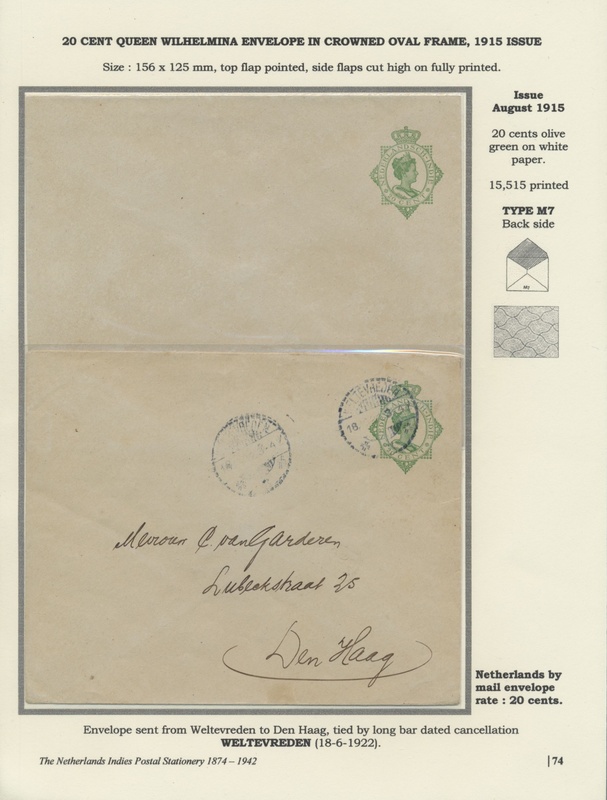 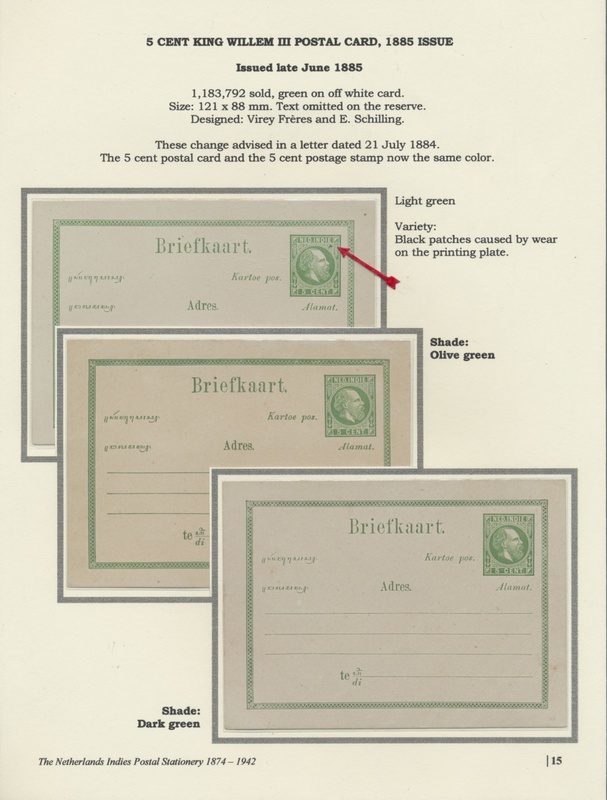 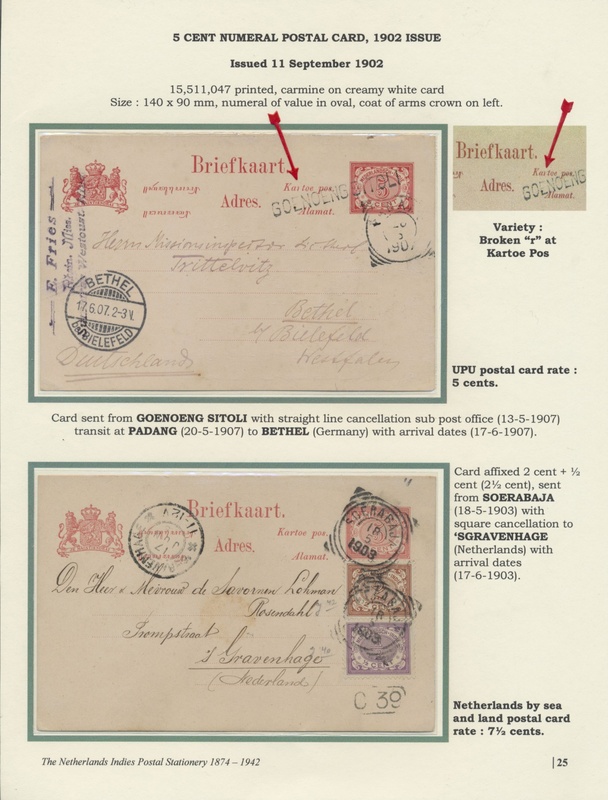 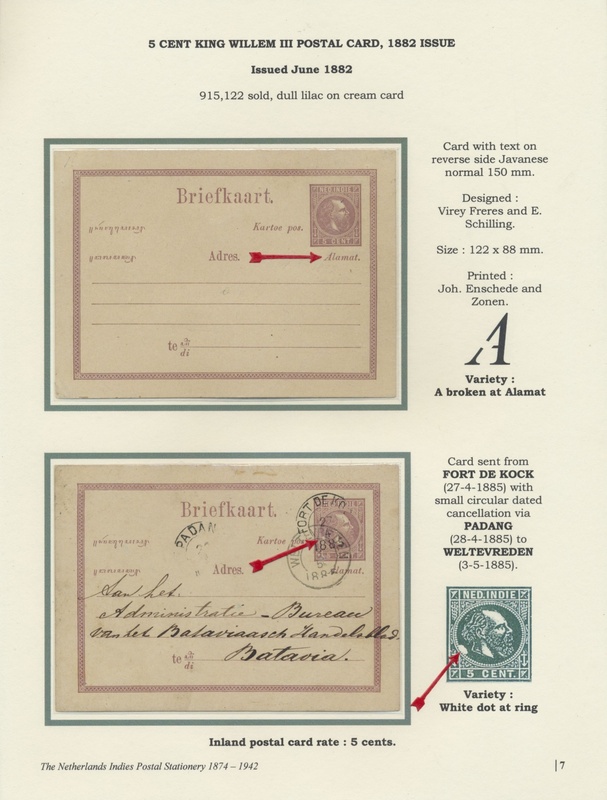 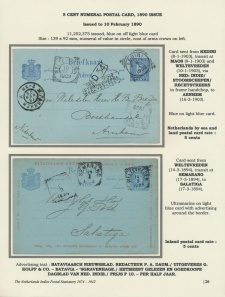 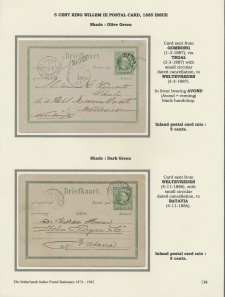 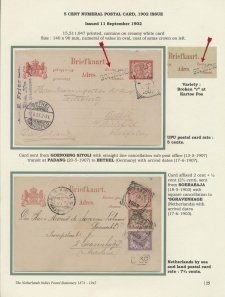 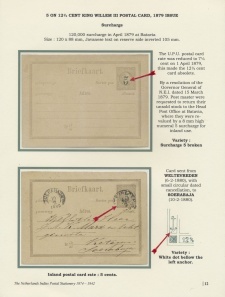 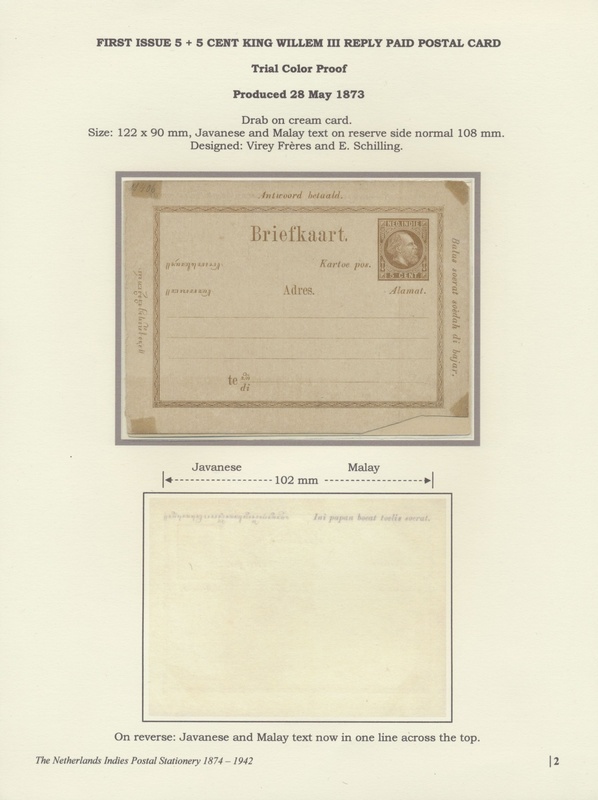 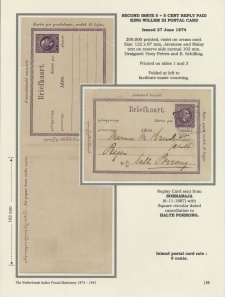 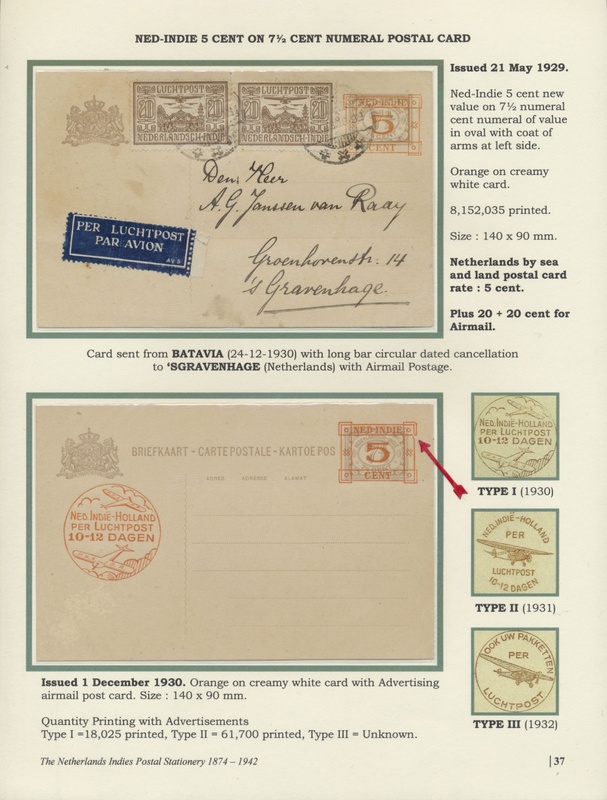 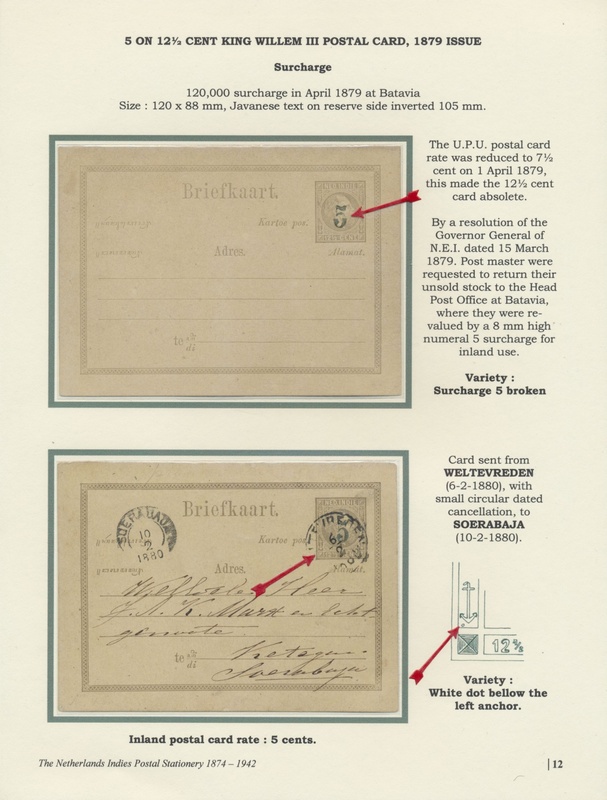 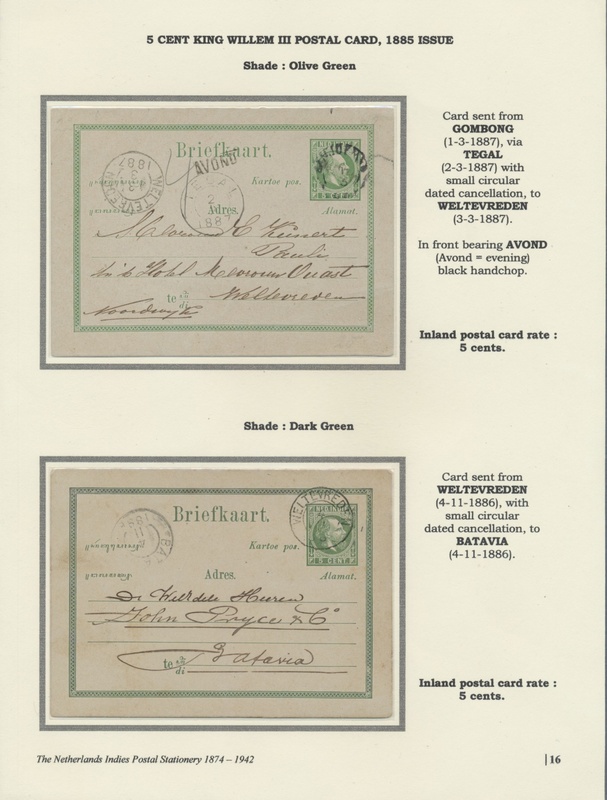 On the whole there are five sections: 1st - Showing the first card with King Willem III face, starting from trial color proof 5c reply card (1873) to 5c green (1885). 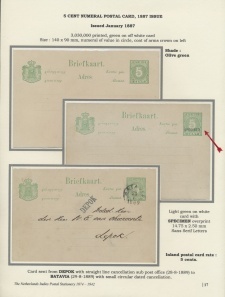 2nd - Showing Numeral isue postal cards 5c green (1887) to 7½c brown (1921). 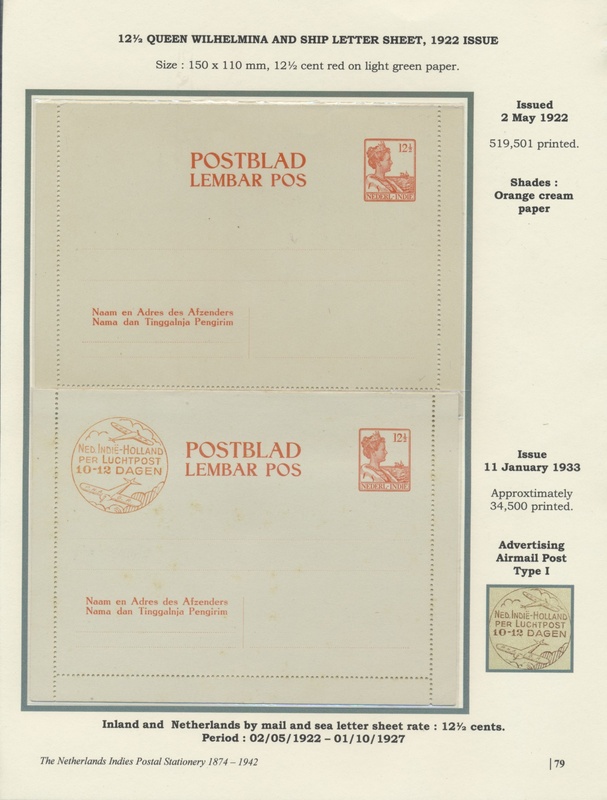 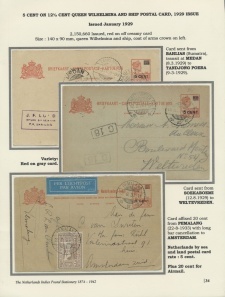 3rd - Showing Queen Wilhelmina issue postal card 12½c (1922) incl. 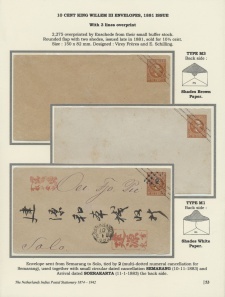 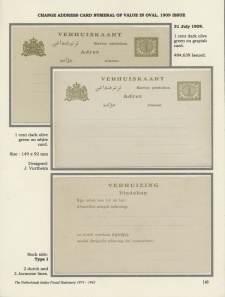 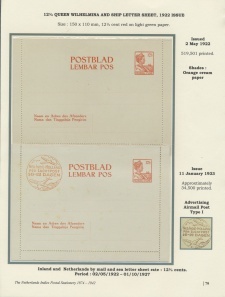 reply card, Numeral (1922) incl. 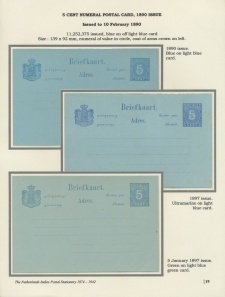 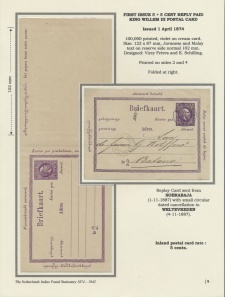 reply card, Buffalo (1931) and removal card (1915/1934). 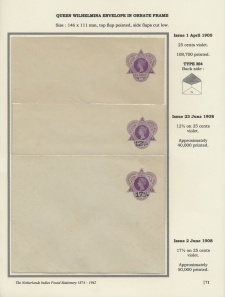 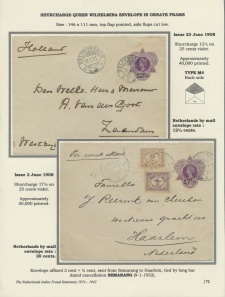 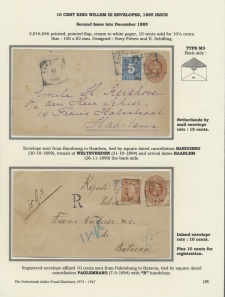 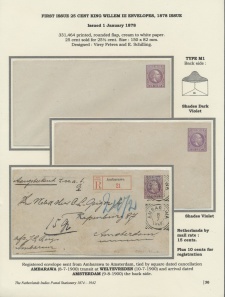 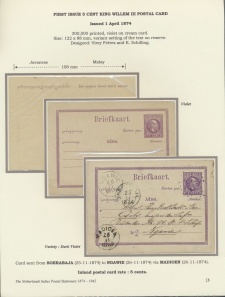 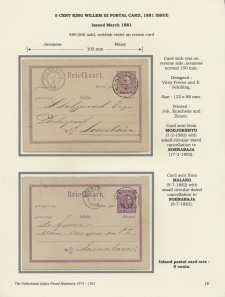 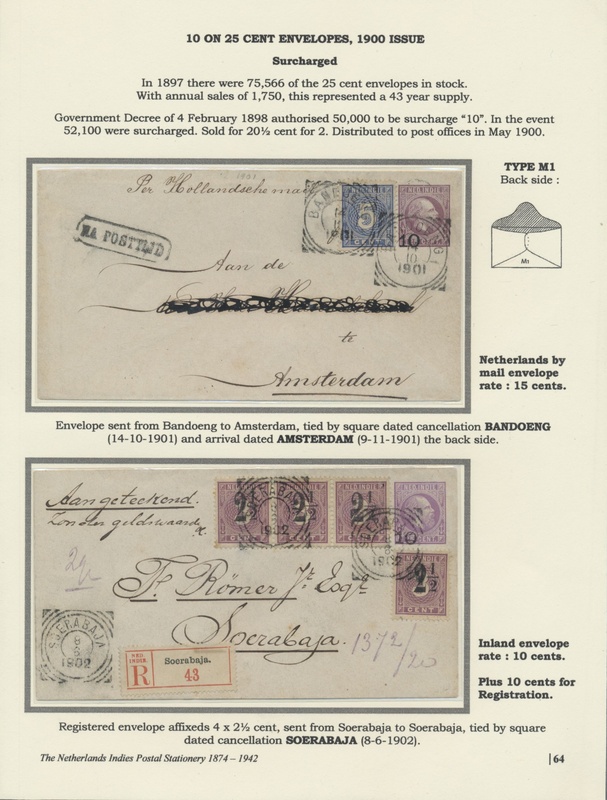 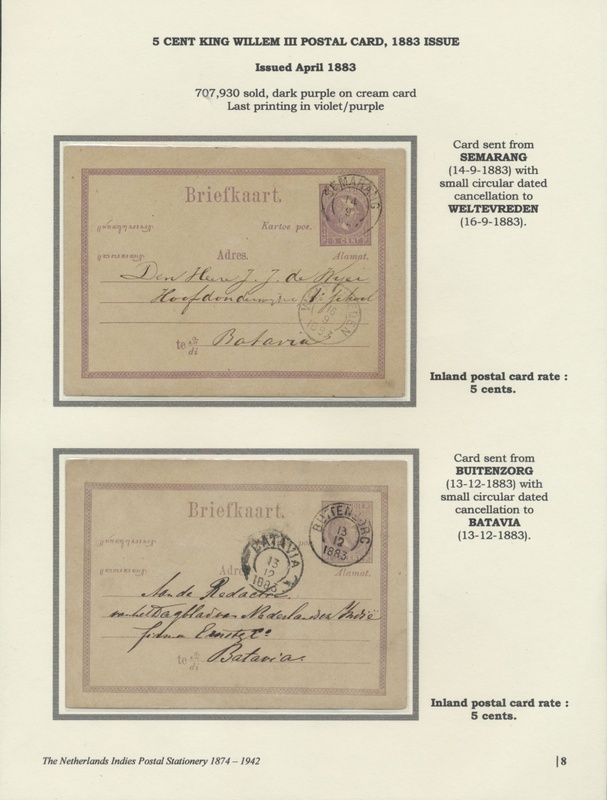 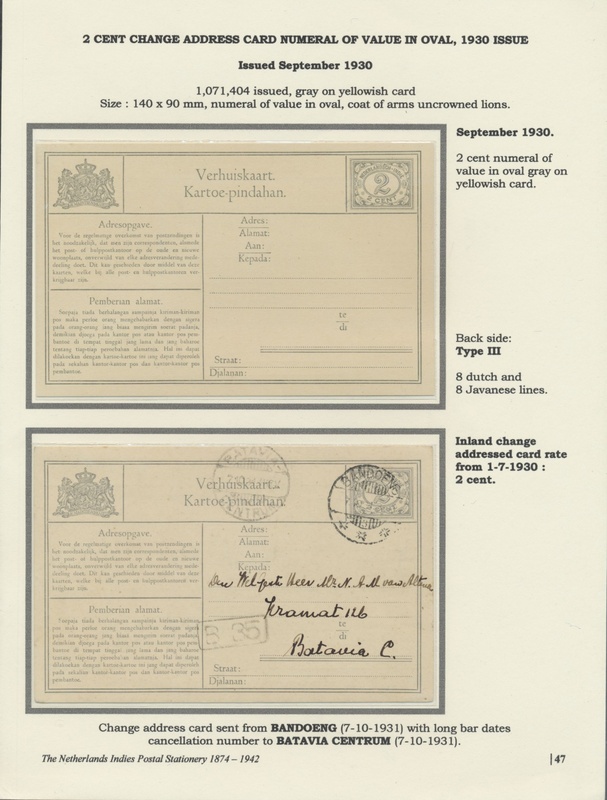 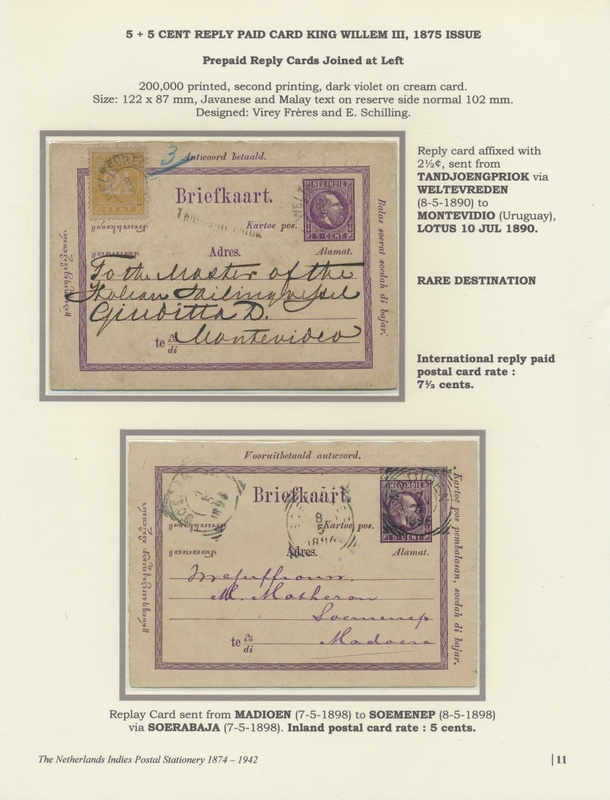 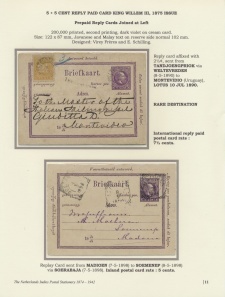 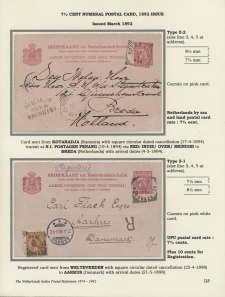 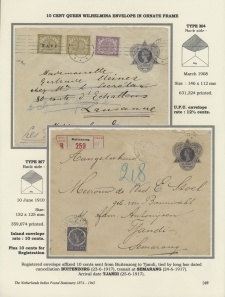 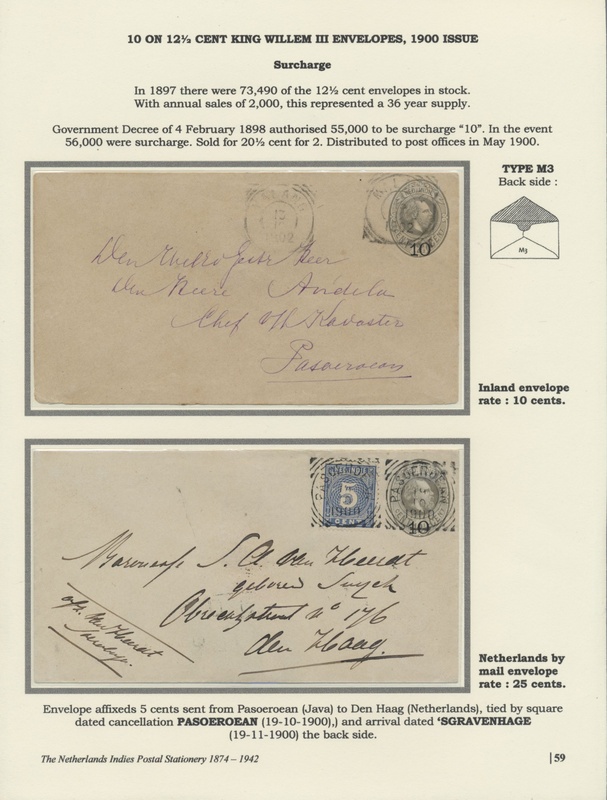 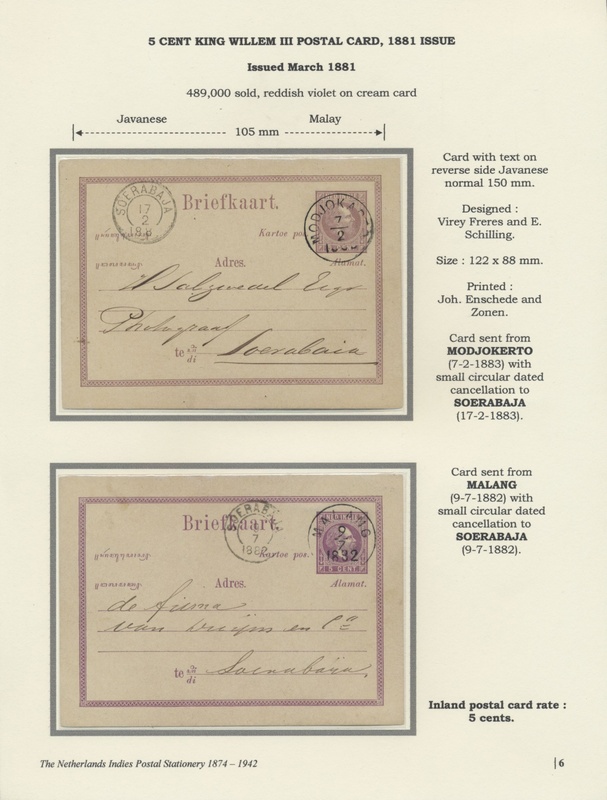 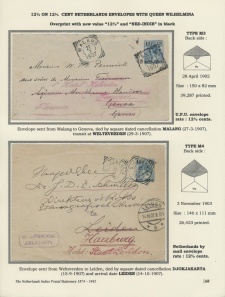 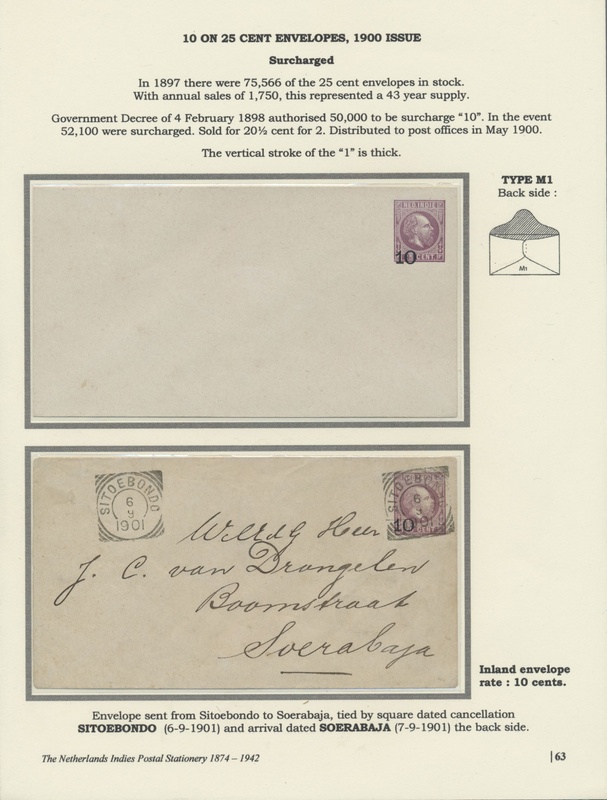 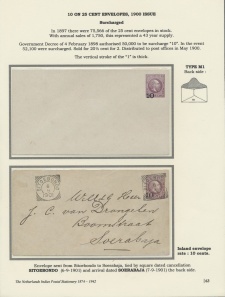 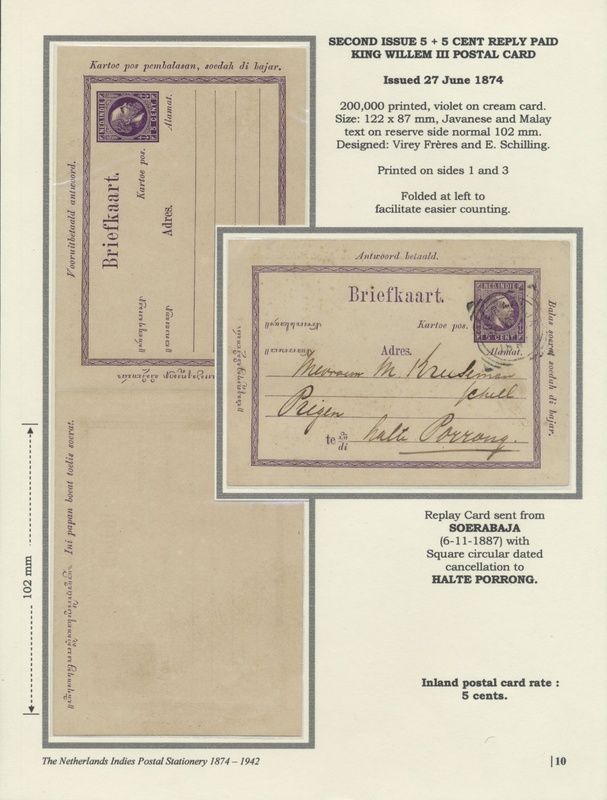 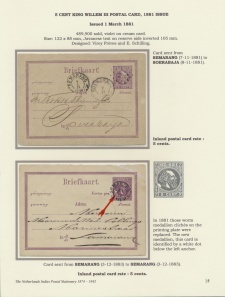 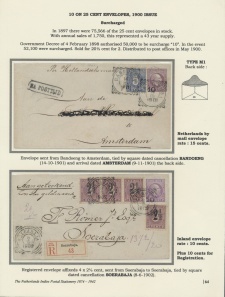 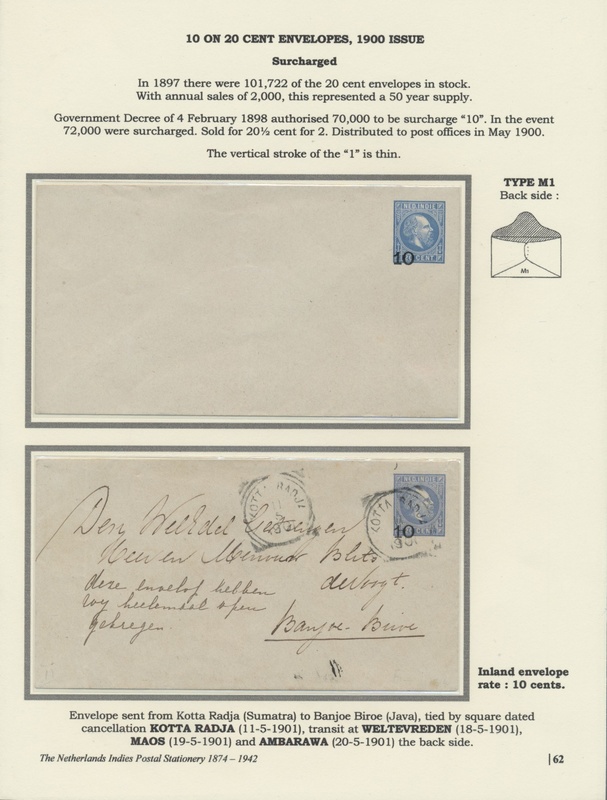 4th - Showing the first issue postal cover 10c brown with King Willem III face (1878) to 10c violet (1900). 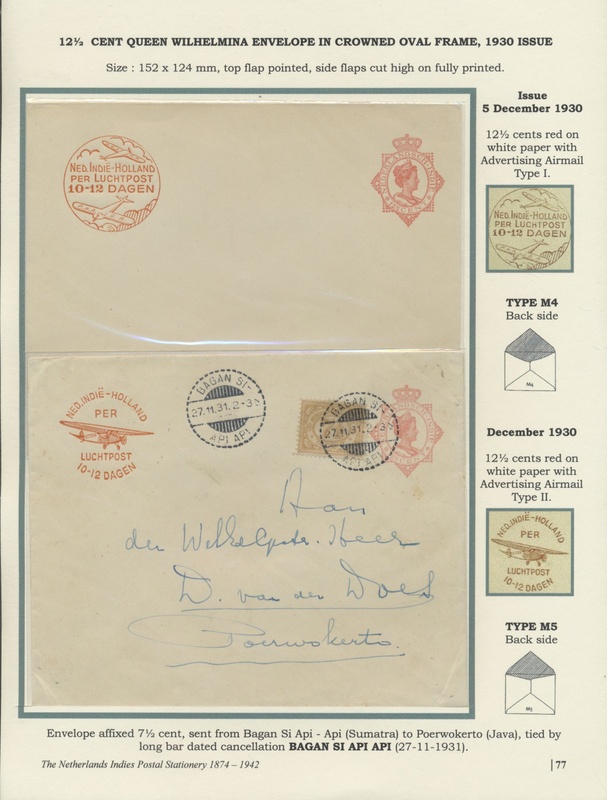 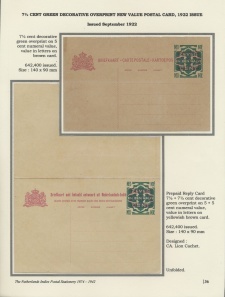 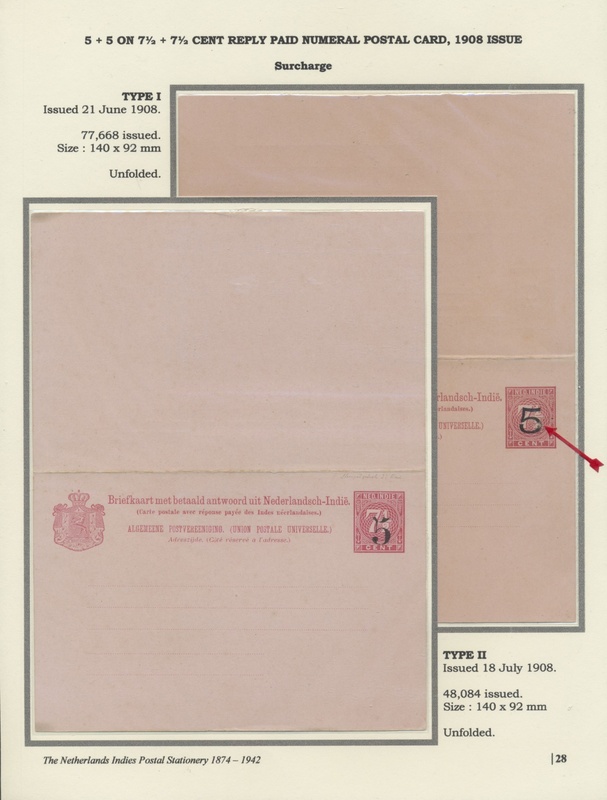 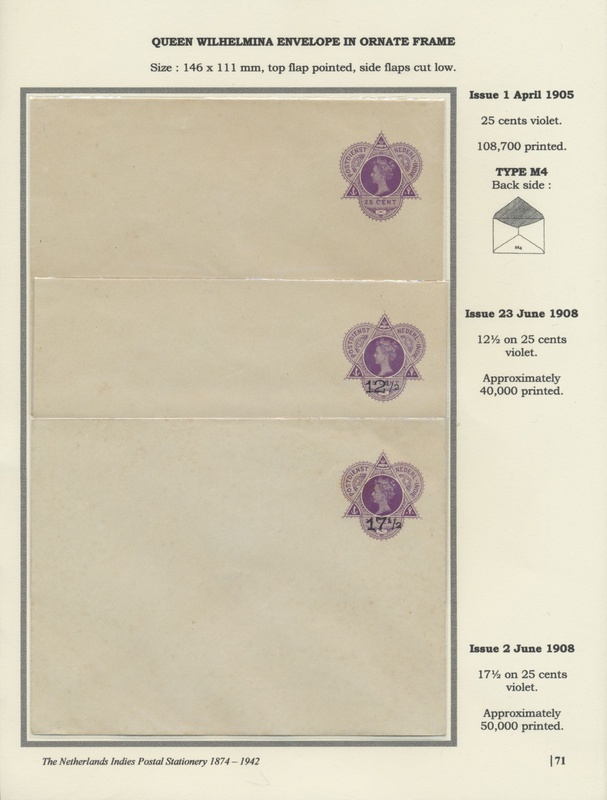 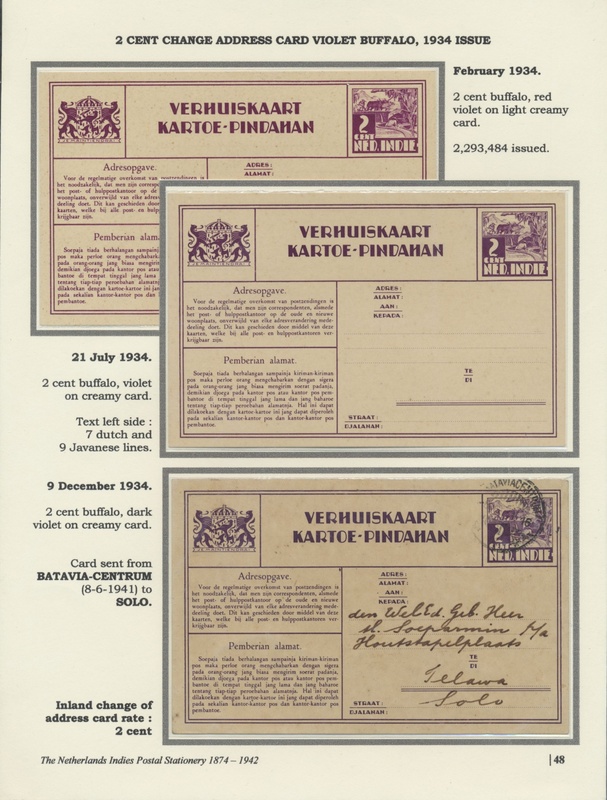 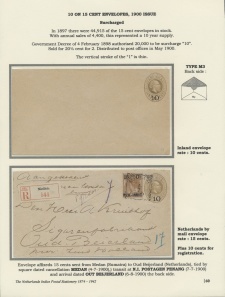 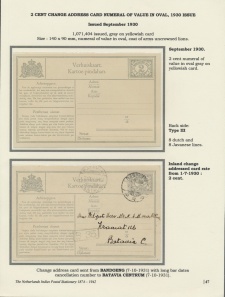 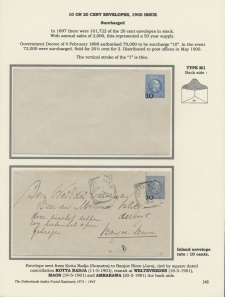 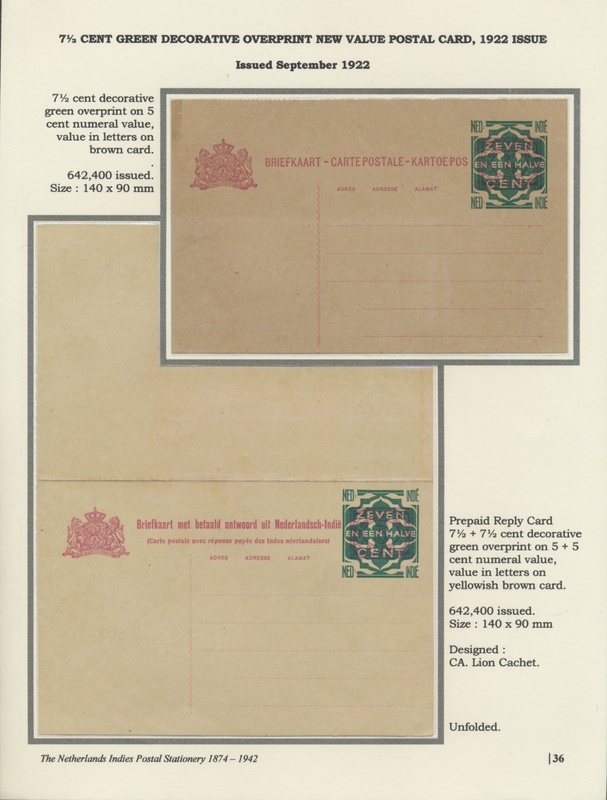 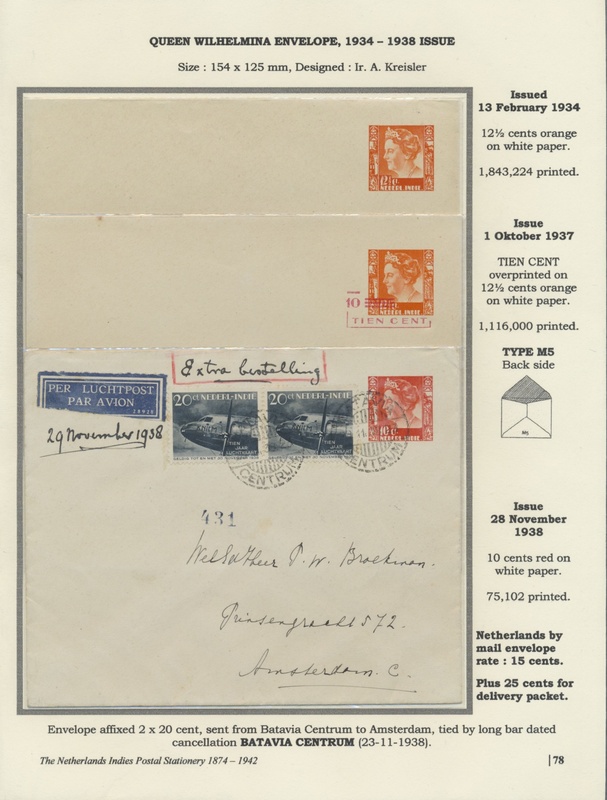 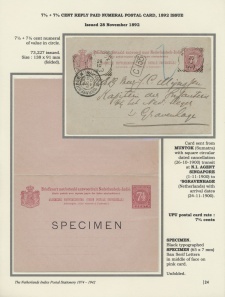 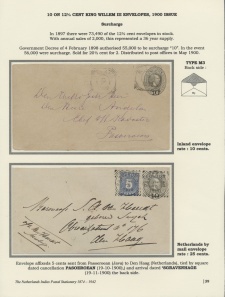 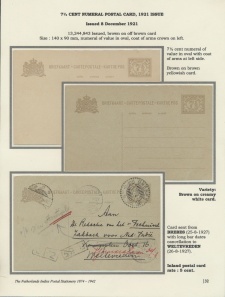 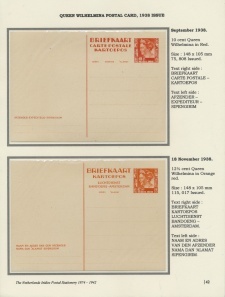 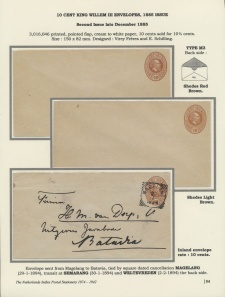 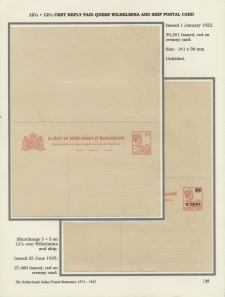 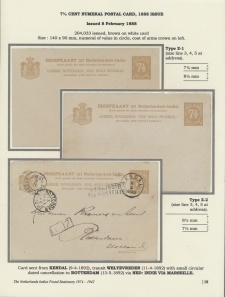 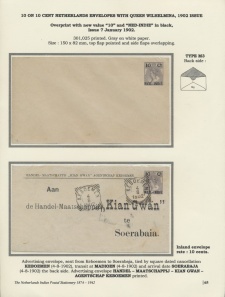 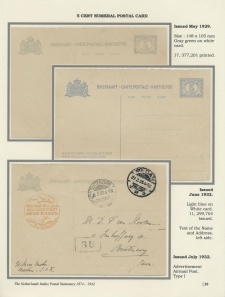 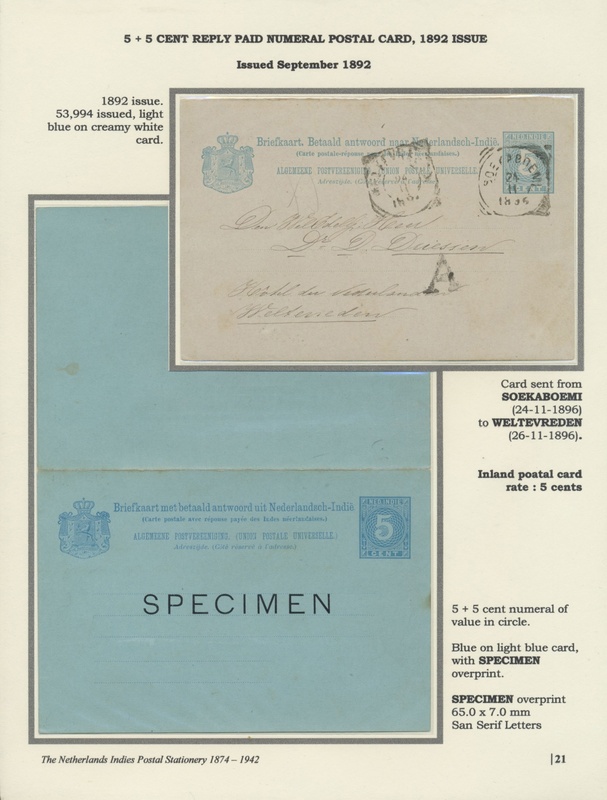 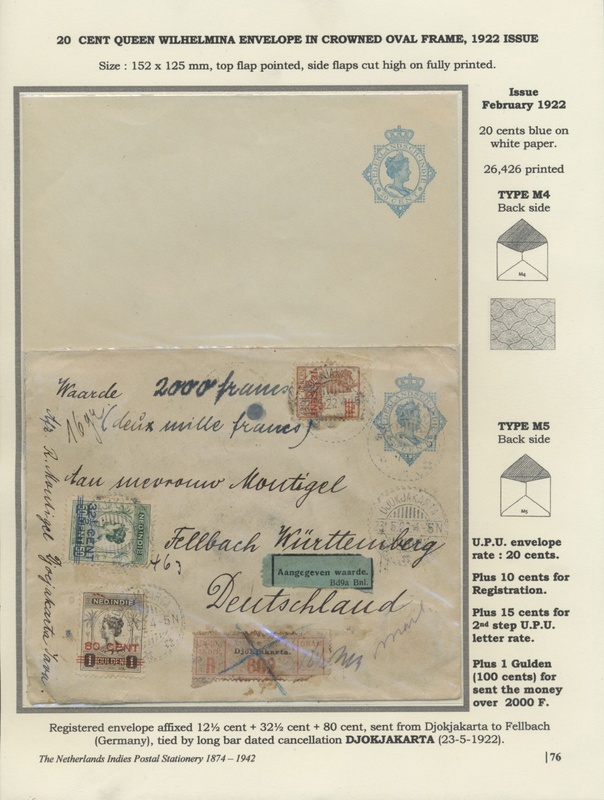 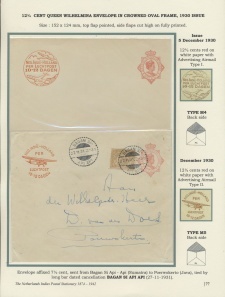 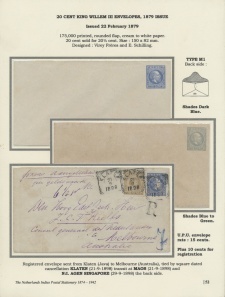 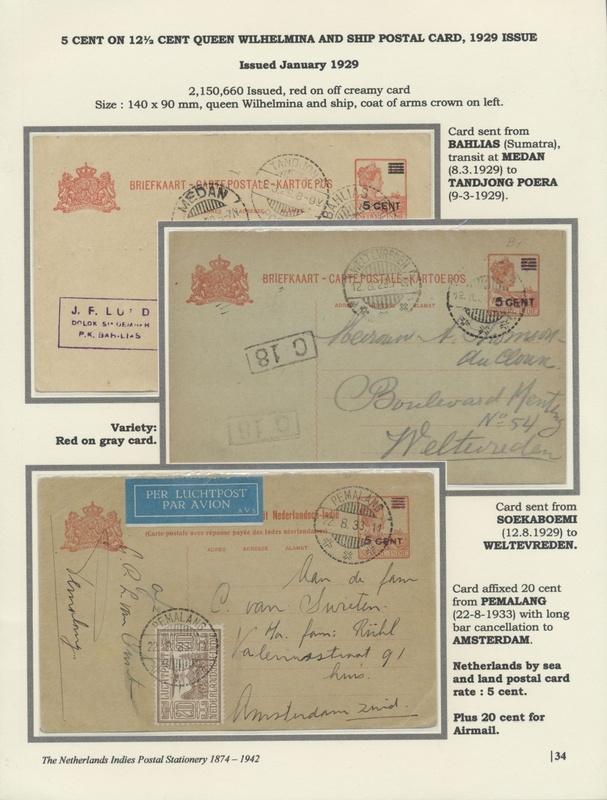 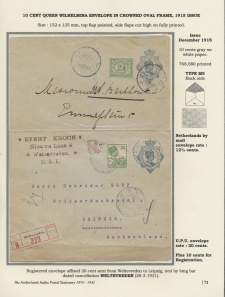 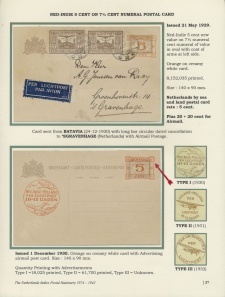 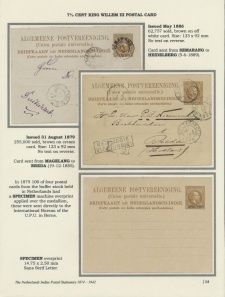 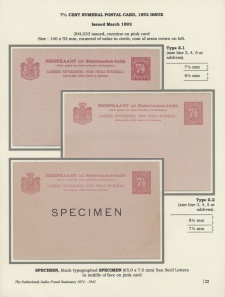 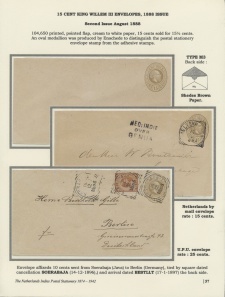 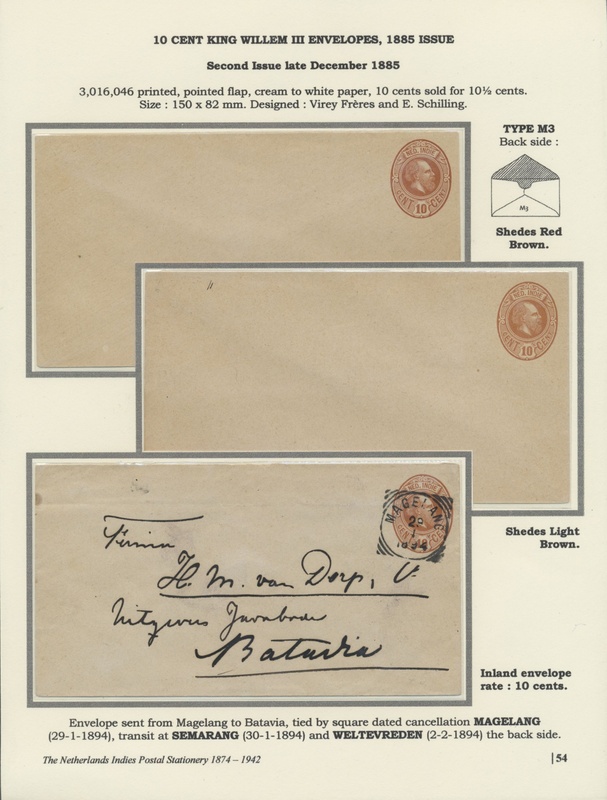 5th - Showing Queen Wilhelmina 10c cover (1902) to 12½c letter sheet (1922) and 7½c letter sheet Buffalo (1936). 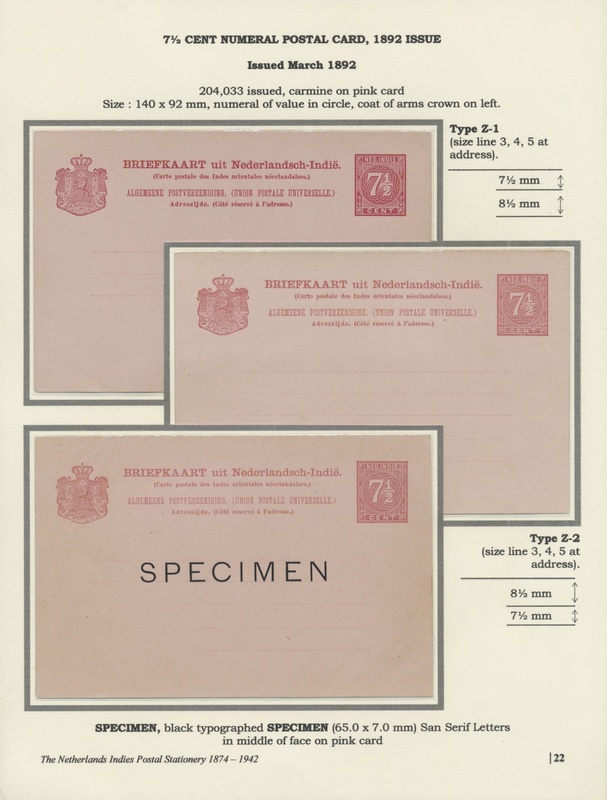 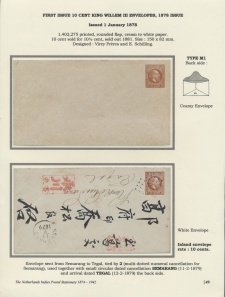 In all sections there are many varieties like different type colors, papers, nominations, rates, overprints, specimen, sucharges and some others more.